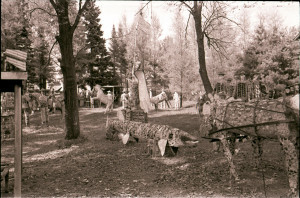 The images in this section are vintage photos taken during the years Fred Smith built the Park, and up to the 1977 windstorm. You’ll find many post-storm and contemporary images, and a stroll through the Park, in Photo Galleries. Right here in town there was a woman sitting right on six horses going lickety-split. Them ideas is hard to explain, ya know. 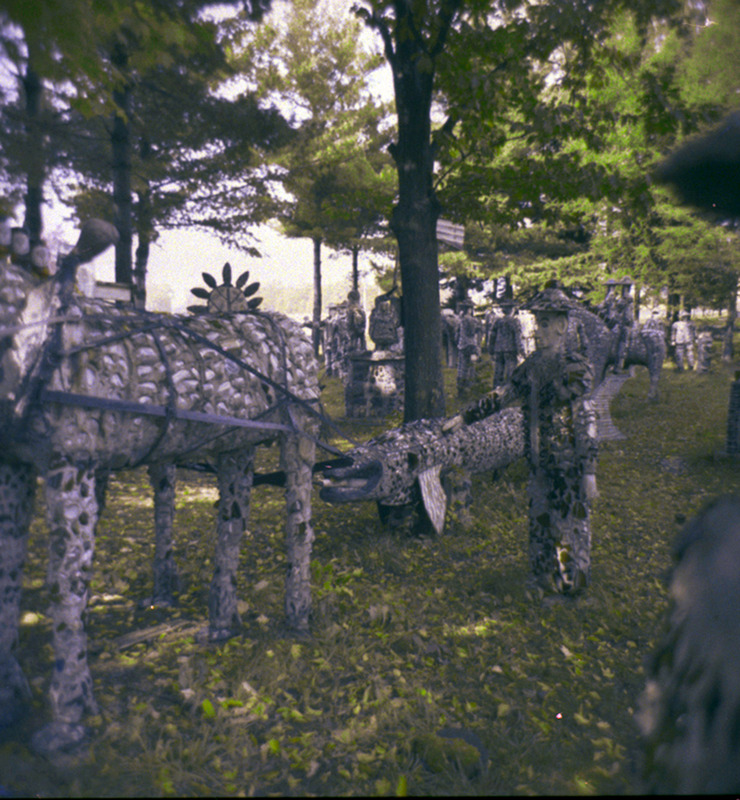 Might be something ya see, or like, or hear from someone else. 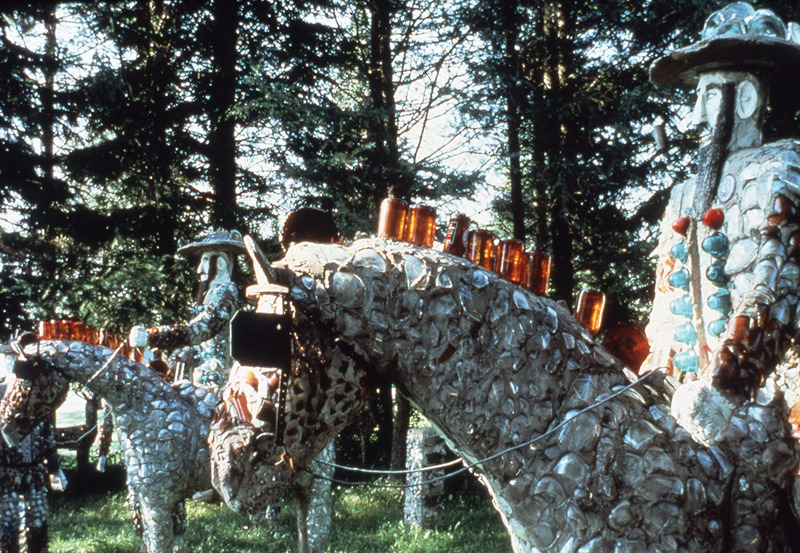 Could be anything… It’s gotta be in ya to do it. 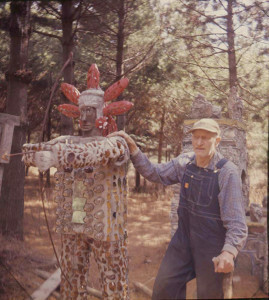 By the time Fred Smith retired from his life as a lumberjack in 1948, he had 62 years of life experience under his belt and a well-spring of thoughts and ideas ripe for expression. 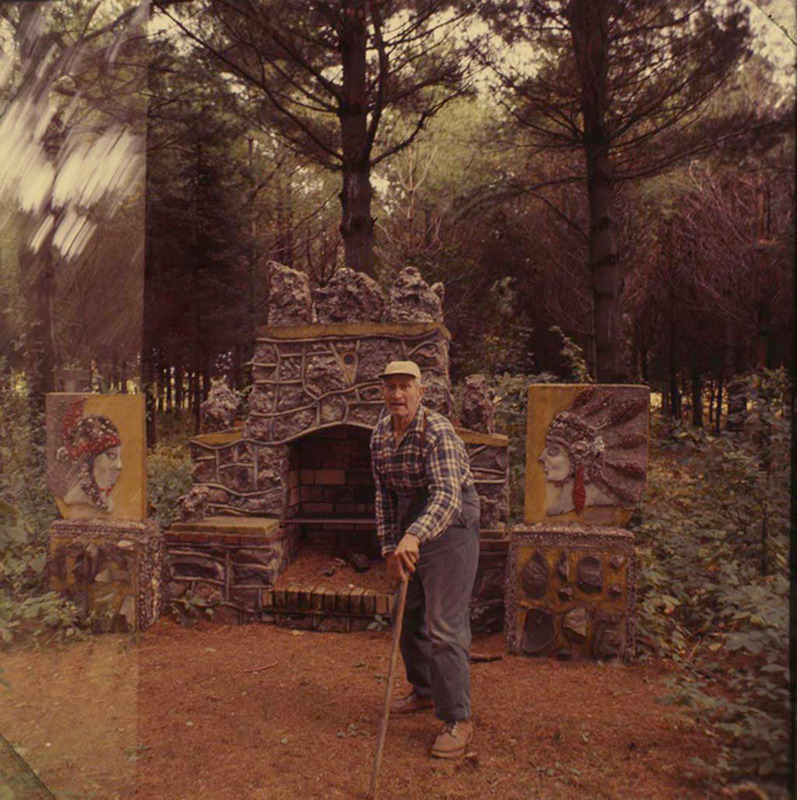 His Rock Garden theme began with the Rock Garden room in the house, which spilled into an elaborate Rock Garden outside, and concluded with his Rock Garden Tavern. 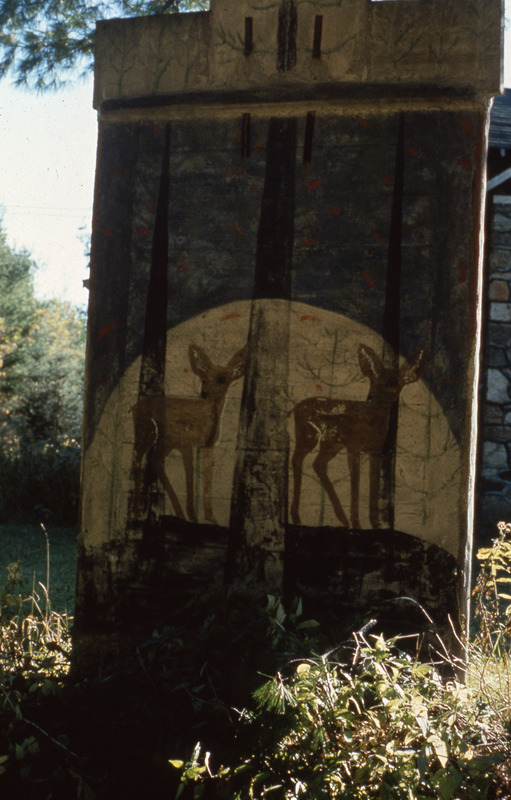 He painted signs and dancing girls on boulders around the parking area, and elevated a shapely flat rock into a concrete footing, near the entrance to the tavern. 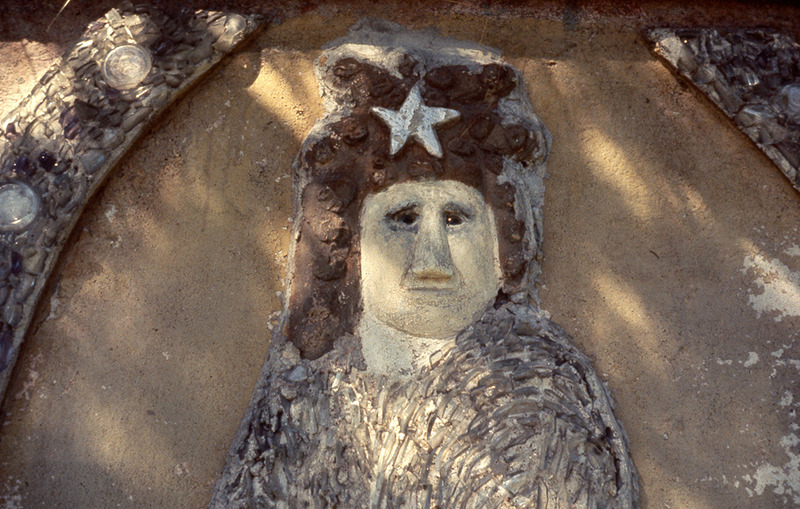 To him it looked like a Native American woman, seated, wrapped in a blanket. 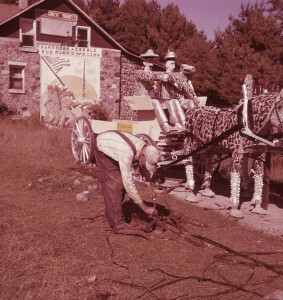 Here the magic began for Fred Smith. 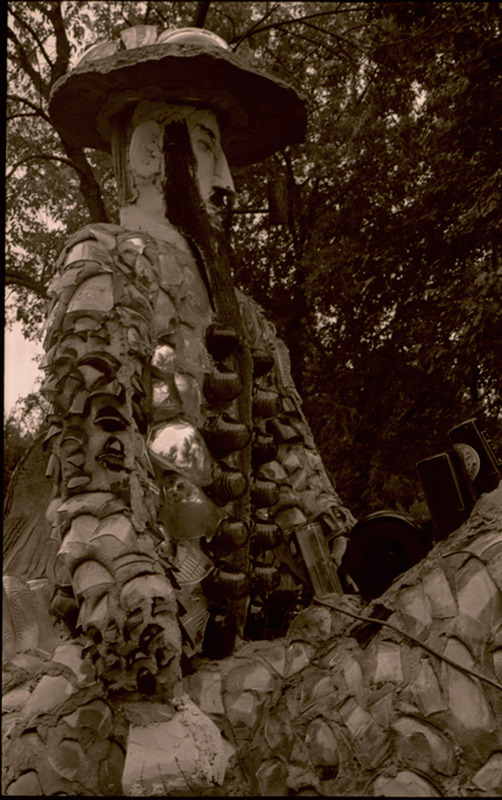 He gave his intuition free reign. 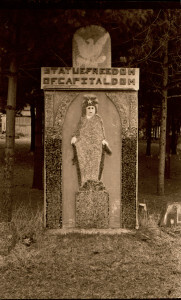 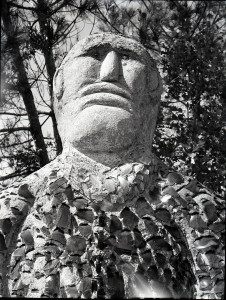 As the story goes, Smith built a grand, stone barbecue flanked by Native American portraits in concrete, to commemorate the baseball teams––the Indians and the Braves–-who played in the Pennant (precursor to the World Series) that year. 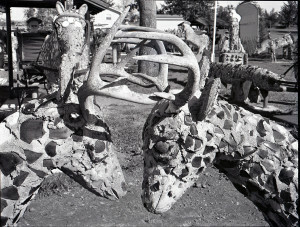 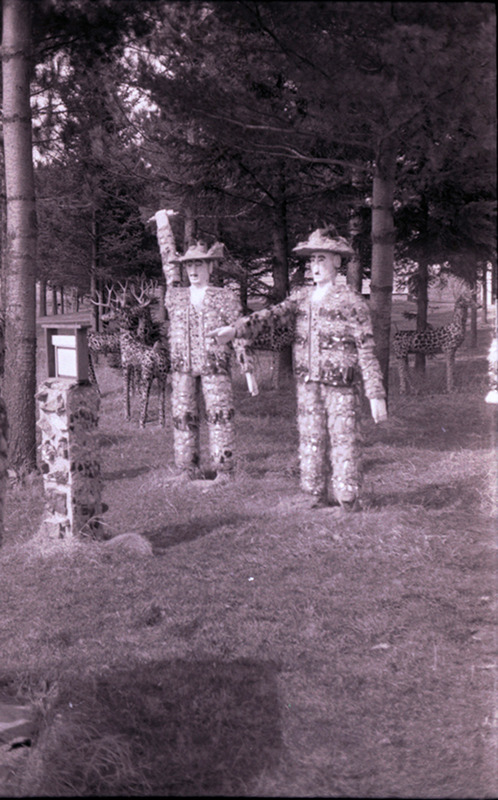 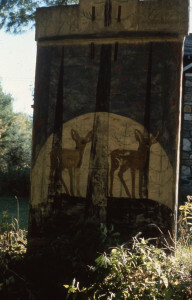 He then made two double-sided Deer plaques, built where his rock garden had been, between the Smith house and the Tavern. 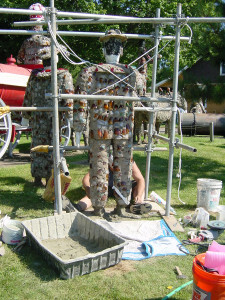 These were built flat and raised upright using a truck and a few helpers. 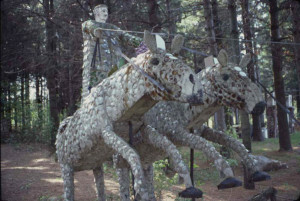 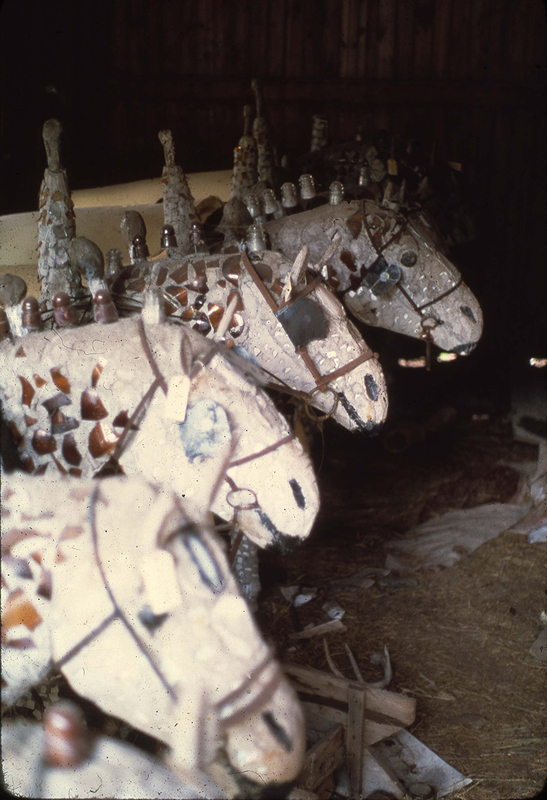 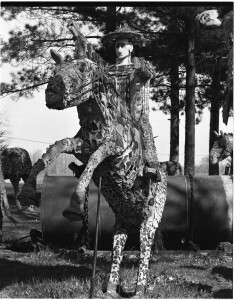 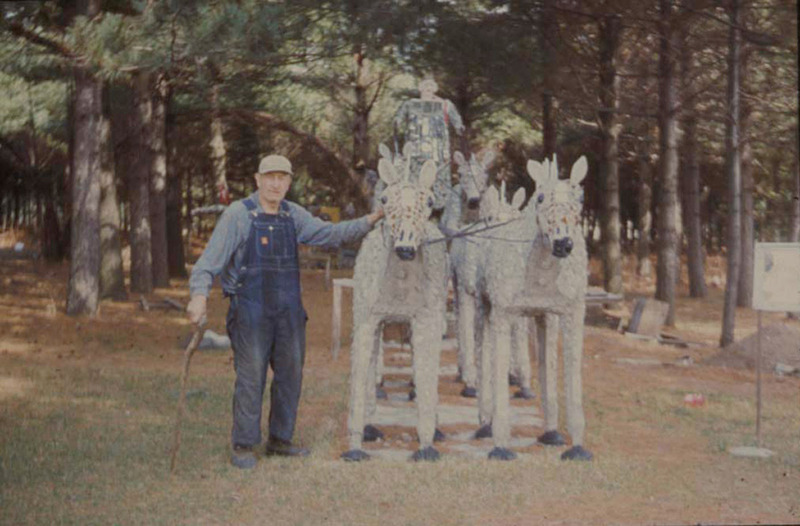 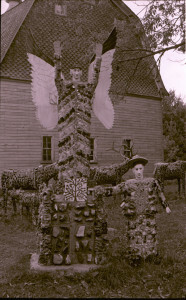 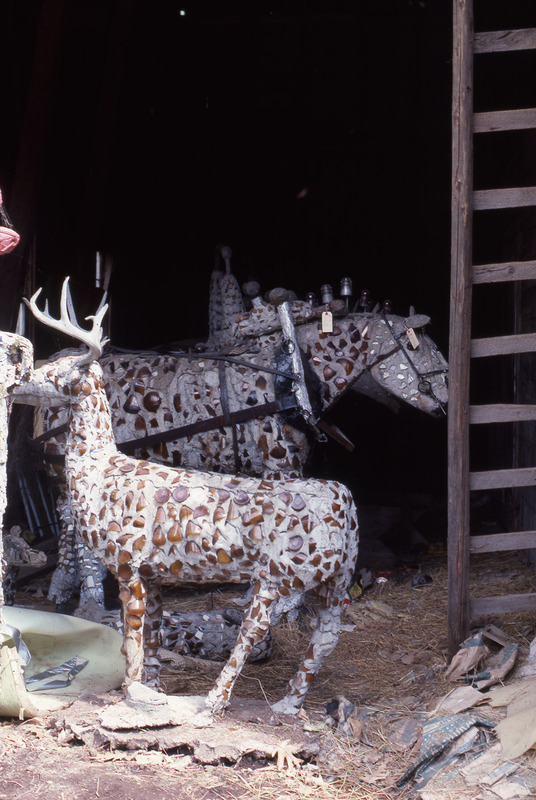 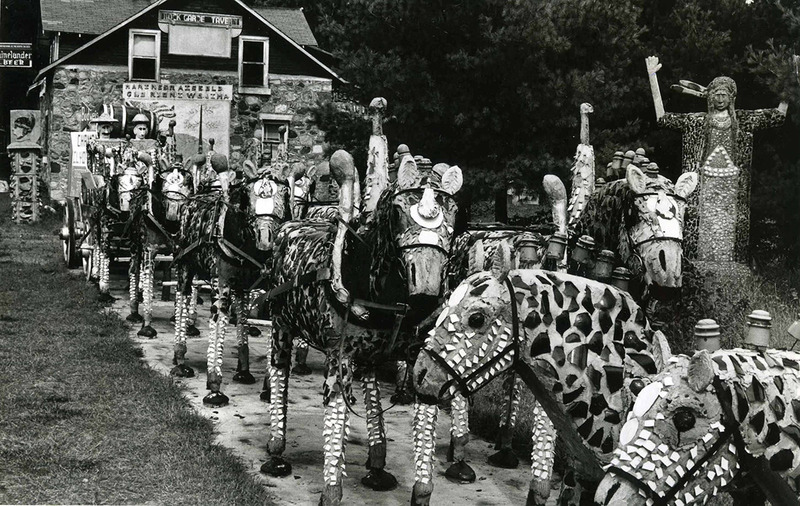 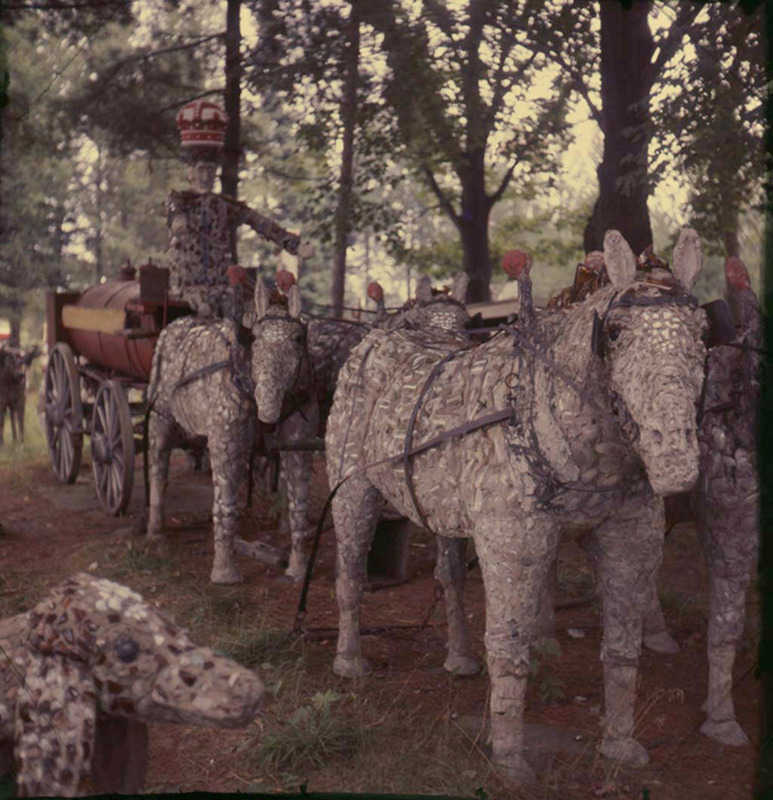 His friend and neighbor, Leonard Lowe, who had a salvage business, helped Smith erect many sculptures and sourced his “horse parts,” harnesses, carriage components, and other objects. 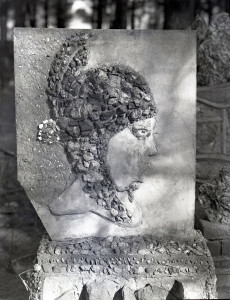 Smith chosen medium was concrete. He ornamented early works with painted scenes and low-relief glass embellishments. Later he decorated surfaces using all manner of glass, auto-reflectors, mirrors, and other found objects. 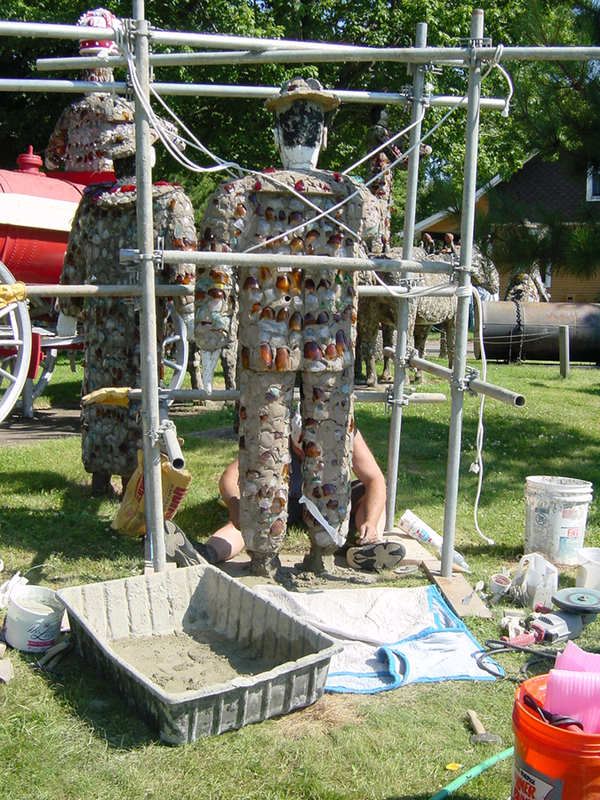 He worked quickly, intuitively responding to materials, learning to build sculpture from the ground up. 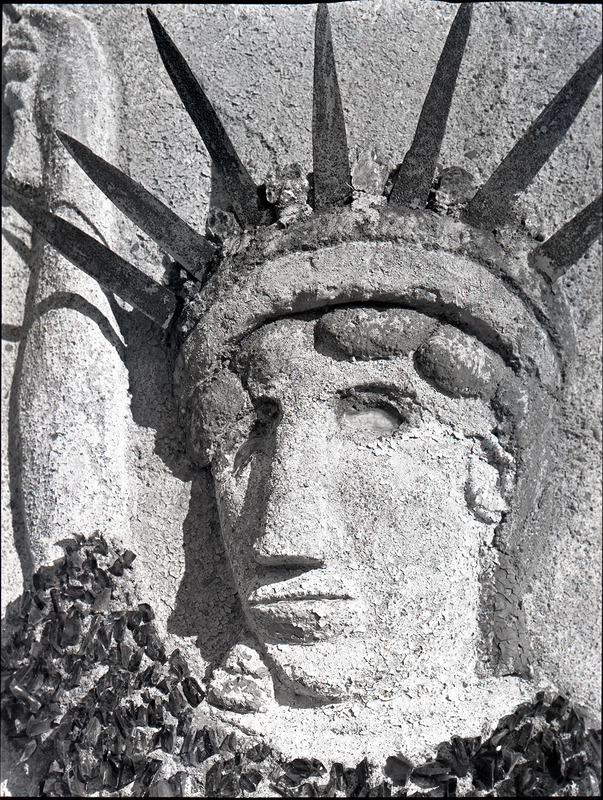 Working around the tavern, he created grand, two-sided sculptures of the Statue of Liberty, the Statue of Freedom on the Capitol Dome. 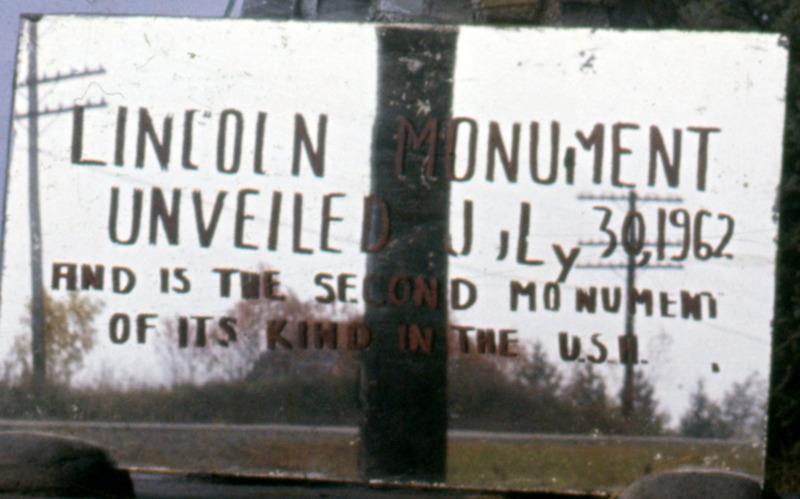 He honored the Chinese statesman Sun Yat-sen, Sacajawea, the Native American guide on the Lewis and Clark expedition, and a monument to the Marines raising the flag at Iwo Jima. 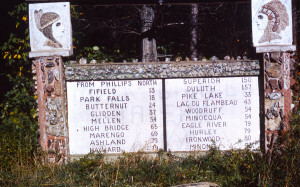 Smith painted northwoods scenes on the back sides of some of the plaques.Smith’s Mileage Marker located the Rock Garden Tavern in relation to places near and far. Smith became adept at building two-dimensional works around the Tavern. Moving to the land north of the Smith House where his focus shifted to recording local history, legends, and ways of life. 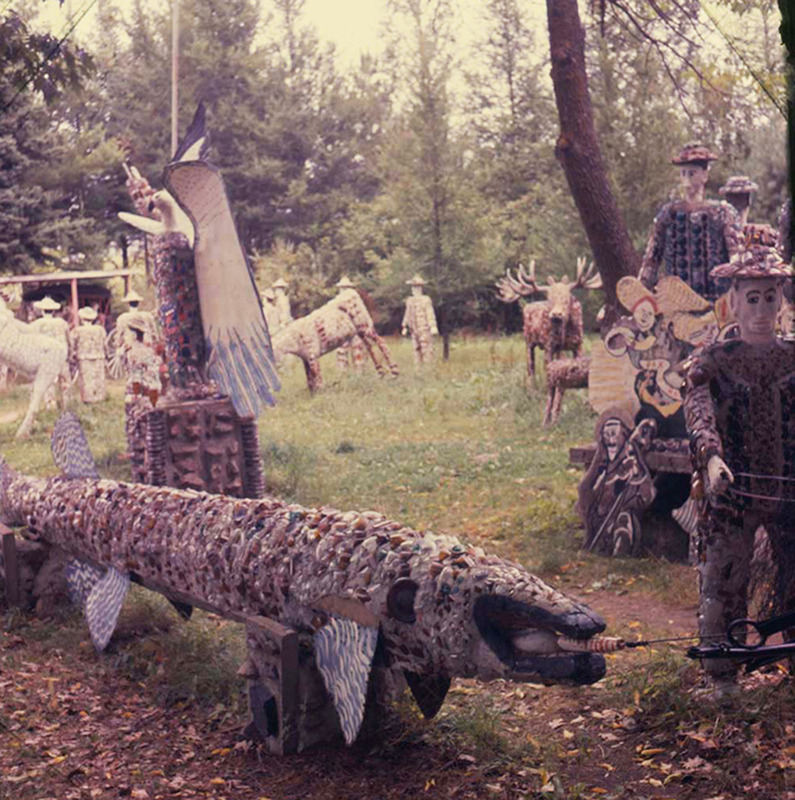 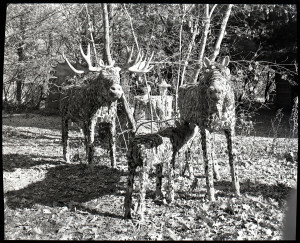 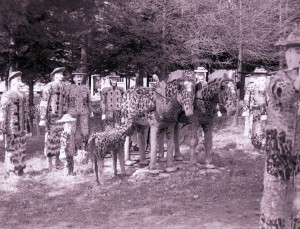 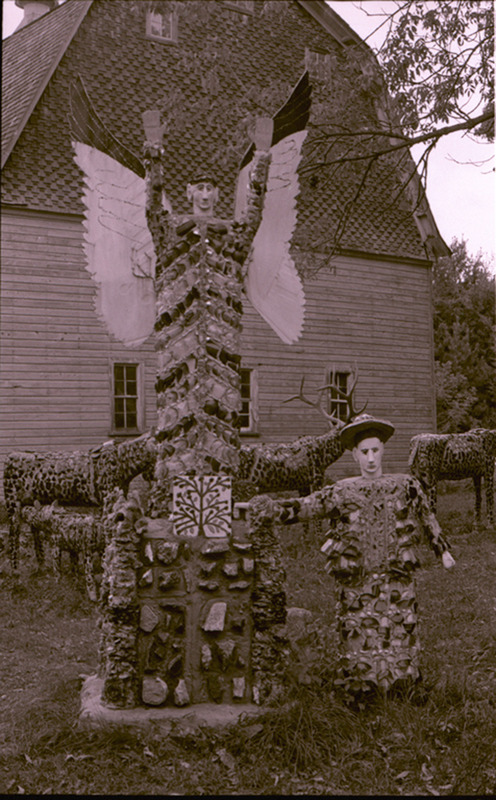 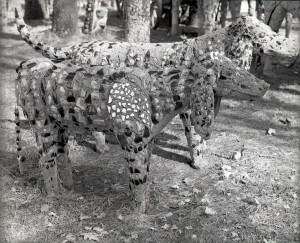 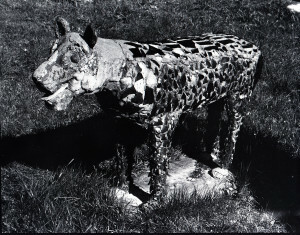 He populated the Park with ninety-nine animal sculptures, including moose, elk, deer, panther, skunk, and bear, from the wild; horses, oxen, cows, and hounds from the domestic realm; an eagle, ducks, and owls from the bird kingdom, and a Lion, Tiger, and Angora Cat, sourced from art history. 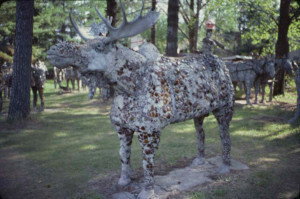 Moose, site plan #4. 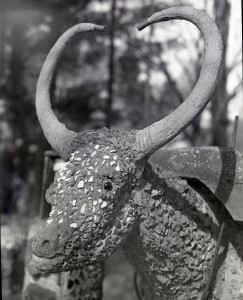 Photo: Robert Amfg, c. 1960-64. 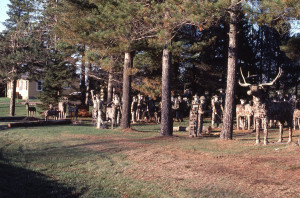 Elk, site plan #5, Photo: Don Howlett, 1976-77. 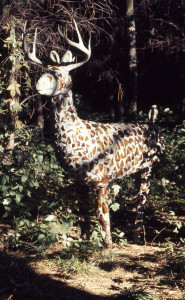 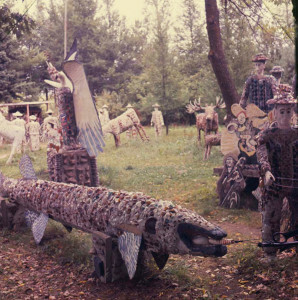 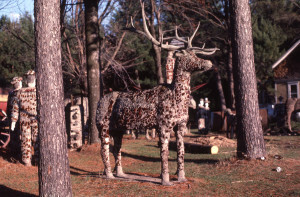 Chicago artist Robert Amft discovered the Park while on a northwoods fishing trip in the 1950s. 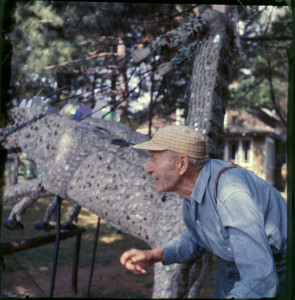 He and Fred became friends and Amft photographed the Park extensively over the years. 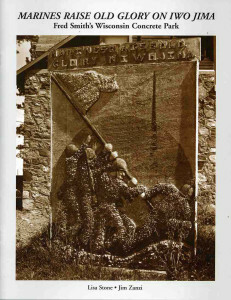 Amft brought Smith a copy of They Taught Themselves by Sidney Janis. 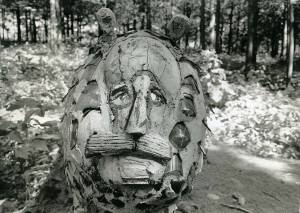 The book contained illustrations of paintings by Morris Hirshfield, a Brooklyn, N.Y. artist, including Angora Cat, Lion, and Tiger. 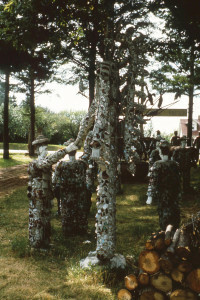 Months later Amft returned to the site, and Smith showed him his newly created sculptures, saying “See, I can do just as good as that guy”, or something to that effect. 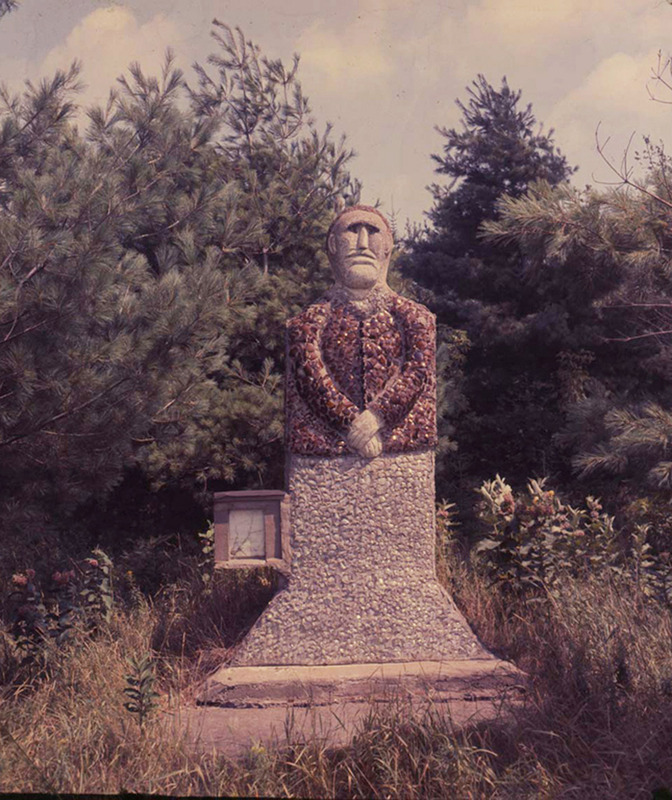 Smith represented the first people to occupy the region, the Ojibwe or Anishnabe, variously. As the story goes, his Indian and Woman tableau (site plan #31) depicts the ratification of a treaty with a local tribe, which Smith may have recalled from childhood. 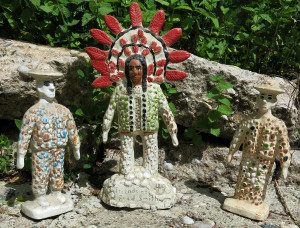 The pact is being sealed with a handshake between a Native American and a white woman. 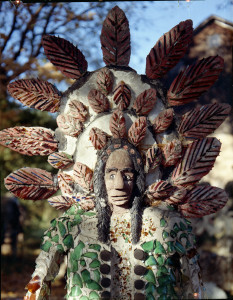 With stunning headdress and clam-shell encrusted garment, the Native American towers over the female figure, at nearly twice her size. 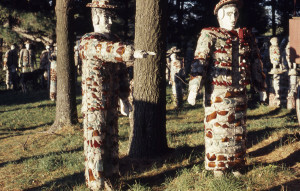 Smith employed this difference in scale to imply the stature of the figures involved, and/or to imply Native Americans as people to ‘look up to’. 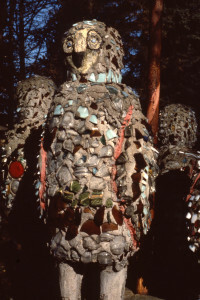 Not far from here they want to run the Indians off. 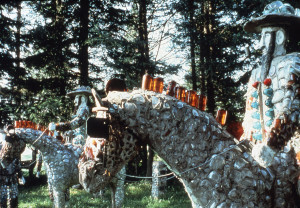 Indians don’t hurt nobody. 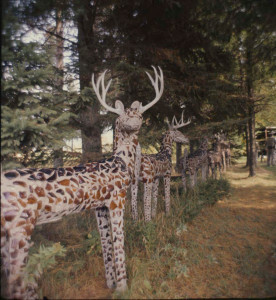 They got the right anyway. 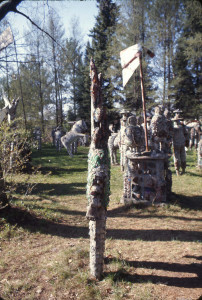 They was the first people here and they want to run them out now. 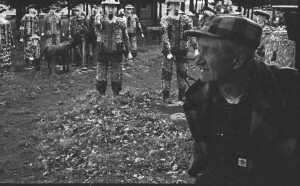 Makes me crazy when I think of that kind of world. 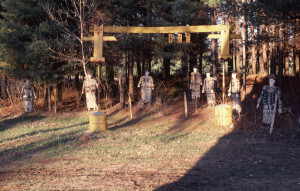 If there was no law I believe they would shoot all the Indians down. West and slightly south of the Angel is Smith’s Indian with Red Feathers. 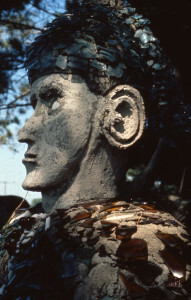 Like the Angel, this piece transcends the scope of the rest of his work, in power and originality. 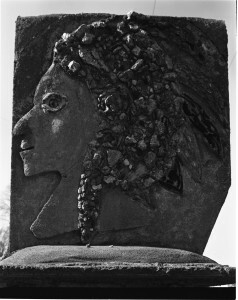 Smith’s Indian with Red Feathers (site plan # 21) features a Native American in full headdress–symbol of high ceremony, individual achievement, and personal radiance. A metamorphosis of this image appears on the reverse, where the headdress is transformed into the archetypal Tree of Life symbol, and ingenious visual synthesis. 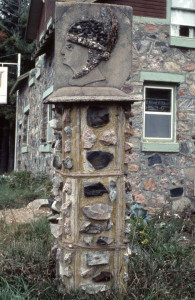 Smith incorporated portraits of Native Americans into his plaques and posts, and created two Native American hunters. 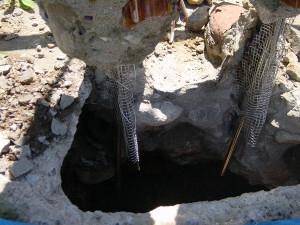 First I make a footing about one-foot deep and pour concrete in it. 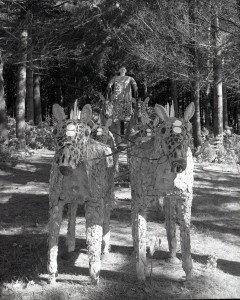 The figures are started with a couple of strips of lumber which I wrap with mink or barbed wire. The arms and hands are made separately. After the form is made I begin filling it in with cement. 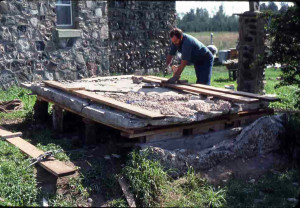 I do half of it lying down, and then I raise it on the footing and do the remainder after it is standing up. 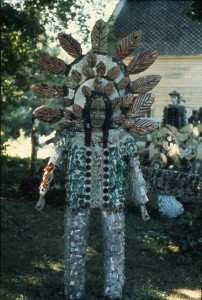 Then the head, arms, and hands are erected to the form. 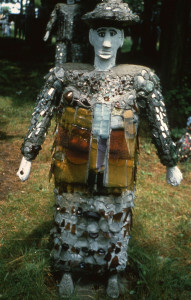 It is then dressed with colored glass and other bits of things. 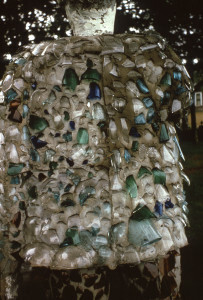 The glass deflects rain, reflects light, and enlivens the sculptures with sensational compositions of texture and color. He delighted in the visual effects that glass and other materials created. 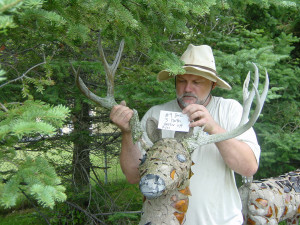 I just like it and could get it for nothing. 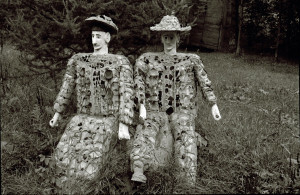 I liked it together. 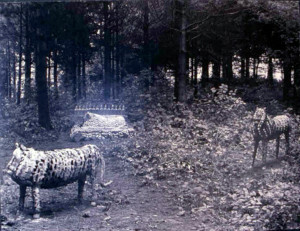 Otherwise your work is too dead. 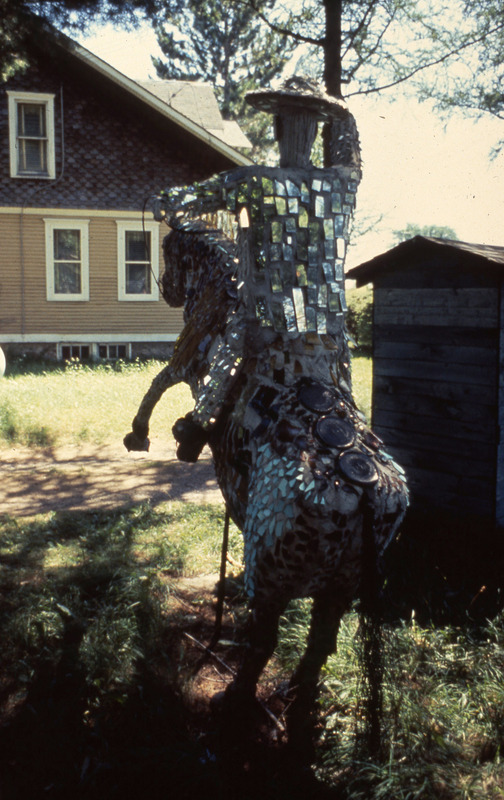 The mirror shines…You find things and find a use for them. Don’t cost a cent. 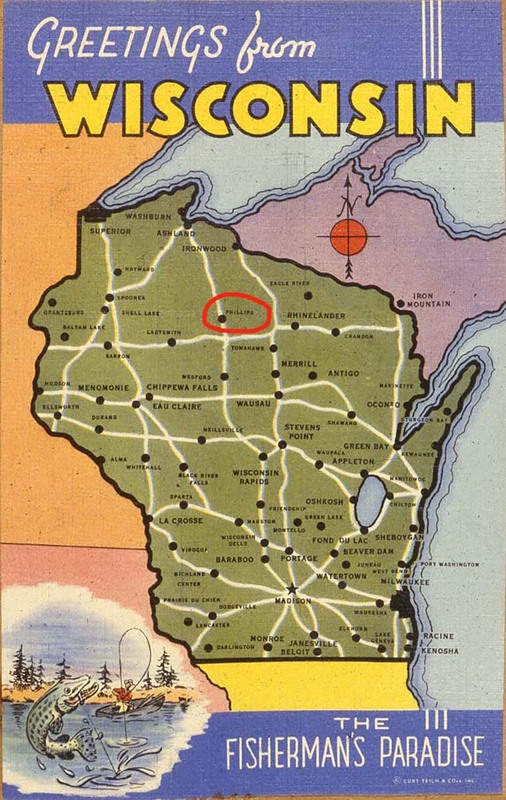 People ask me if I need things from all over the country. 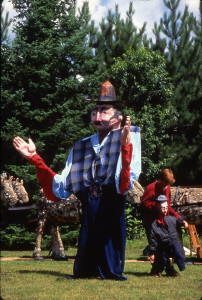 Everyone likes me! 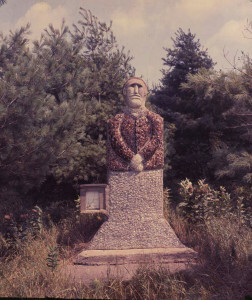 Smith fleshed out the Park with the succession of European immigrants to the region, including Czech, Bohemian, Swedish, Finnish, German, Norwegian, and Polish, immigrants. 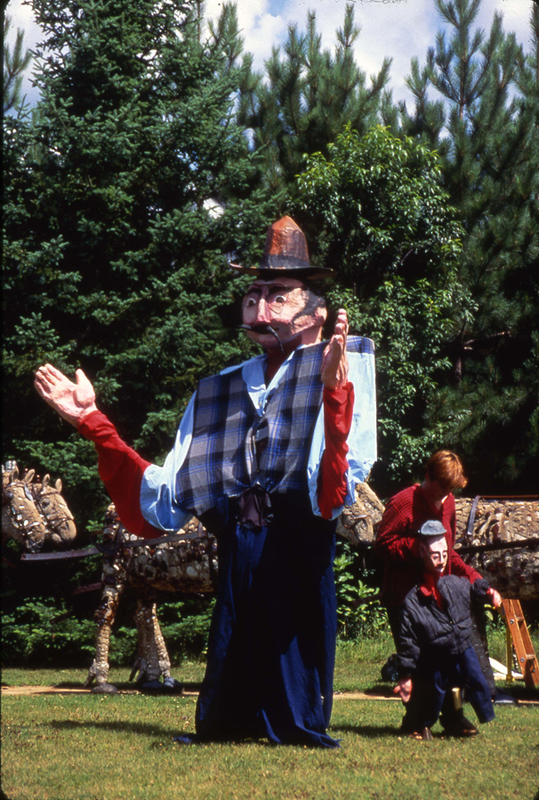 He created a number of tableaux showing how the newcomers worked and dramatically altered the land, beginning with the lumberjacks. 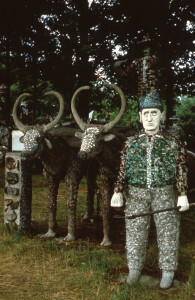 Paul Bunyan shows here the first power that came in for logging and farming is called oxen. 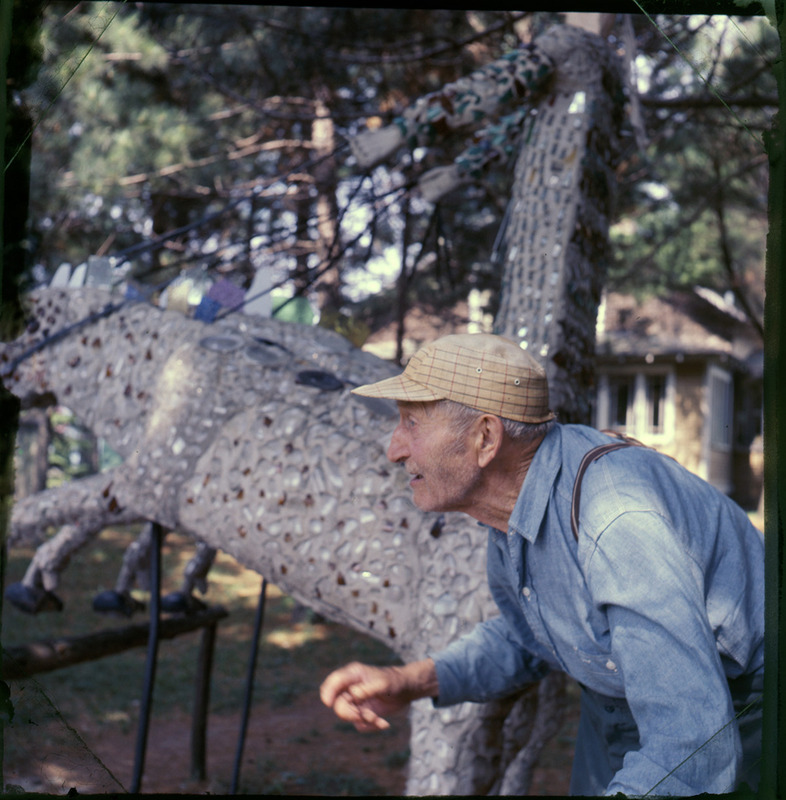 Mr. Knox shows here how oxen are worked and tells how oxen are hooked up. 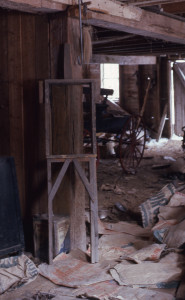 Only a heavy chain hooked from the go-devil onto the link in the yoke. It shows how to lead them when they are at work. 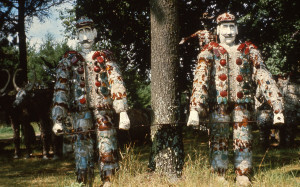 It shows here also a gang of his sawyers, Barry Swansen and Gust Johnson, the two big lumberjacks with an 8 foot saw. 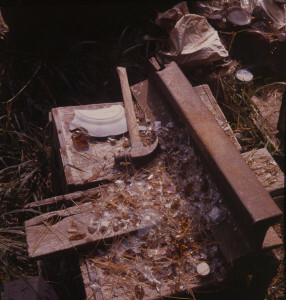 It shows some of his logging tools and the two large wolf hounds he hunted with and also one of his bear traps. 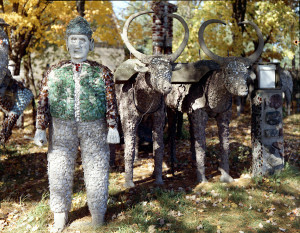 Paul Bunyan, the greatest logger in the state of Wisconsin, and his three oldest lumberjacks.” The Oxen are hitched to a water tank used to ice down the roads in the woods, so huge sleds of lumber could be dragged from the woods. 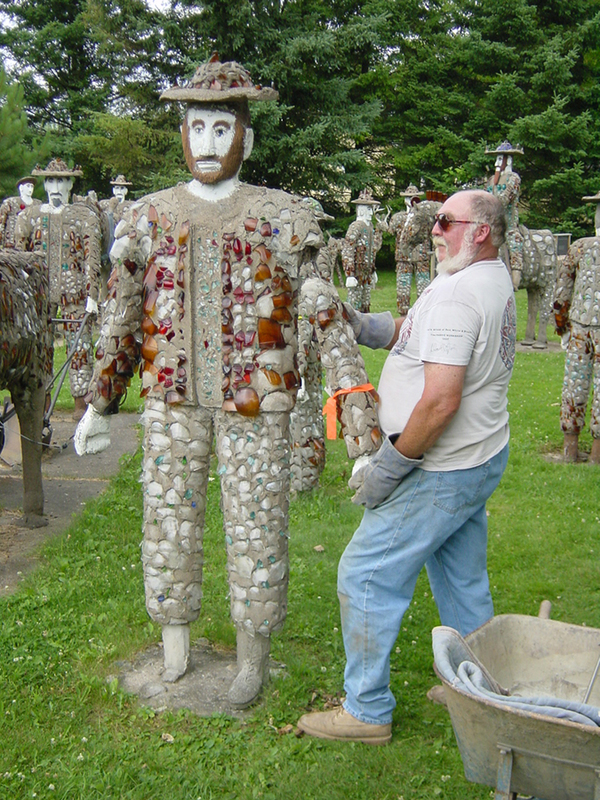 People said I couldn’t set him on marbles. 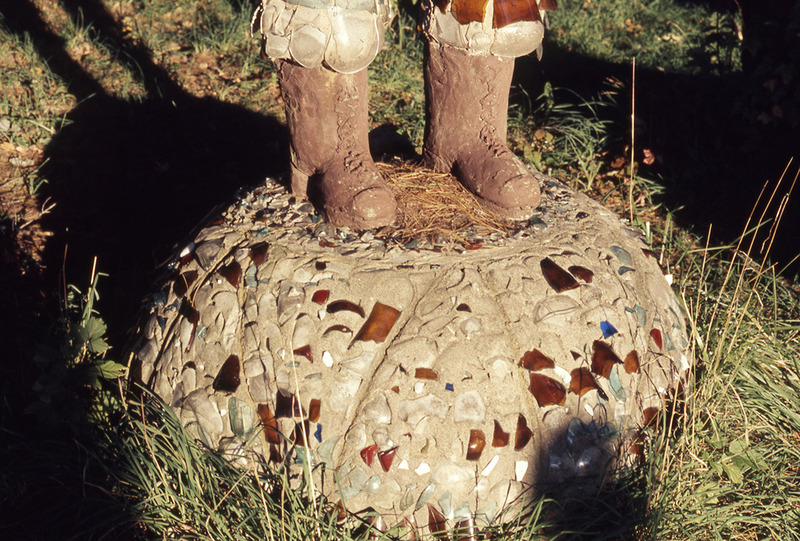 He’s sittin’ on goddamn marbles, y’know. 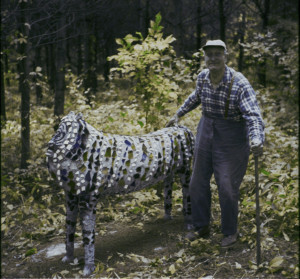 People thought I was crazy. 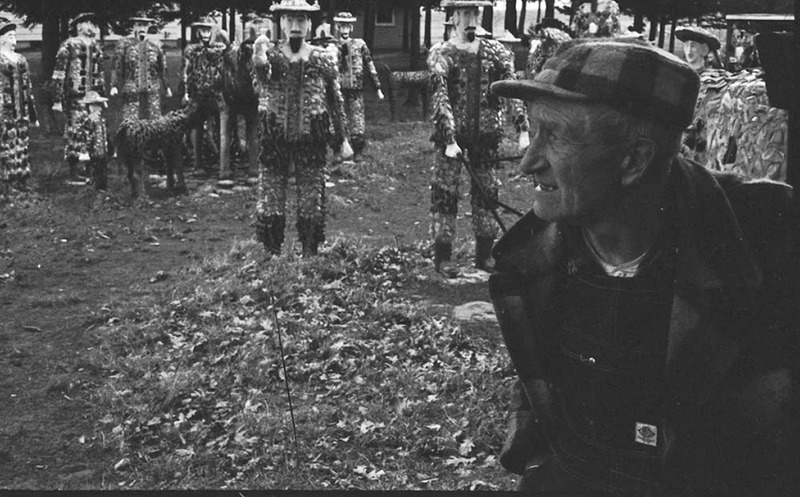 But he’s young, Paul y’know. 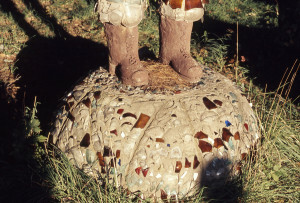 He stands on marbles. 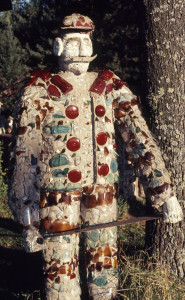 I went down to the junk man and he gave me some glass off of cars and I put the glass on Paul Bunyan all the way up. 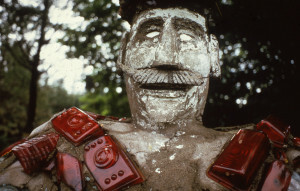 The junk man gave me the glass. All I had to do was pick it up. 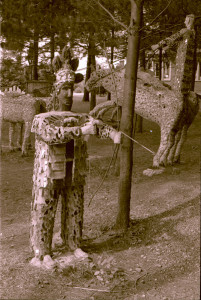 That’s the way it started, y’know. Smith’s spatial narrative of local history continues with the Stump Farmers, site plan #23. 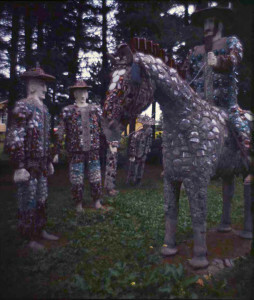 The grand figures on horseback represent Henry Mocavits and John Putro, who cleared the stumps for farming. Smith’s Farming with Horses (site plan #11) and Farming with Oxen (site plan #12) show farm families gathered around, watching farming with draft animals. Smith narrated information to accompany several sculptural settings, to a typist. 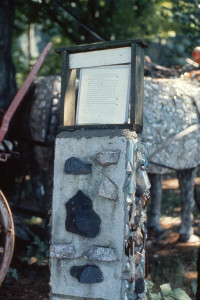 He encased her typed sheets of paper in glass and mounted them on stone and concrete posts. 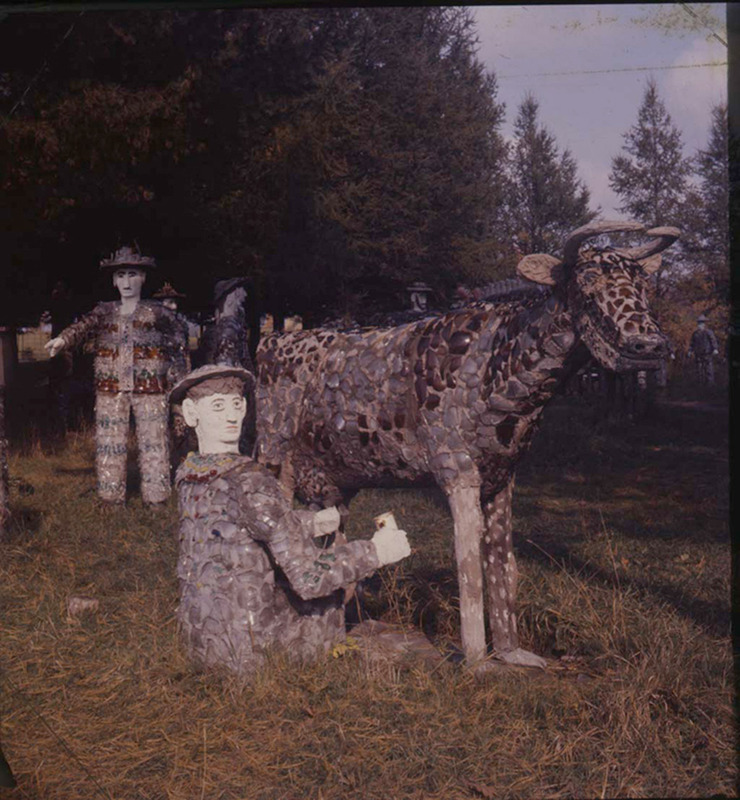 His statement on Mable the Milker (site plan # 7), is now preserved on an aluminum plaque: Mable, an old milker, has been milking cows for many years. 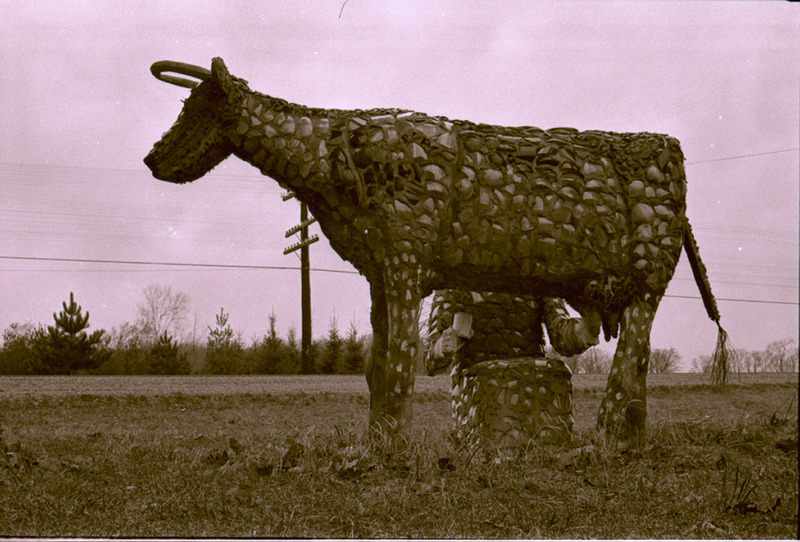 She has tried all the power milk machines. After milking by hand for many years, she finds that the hand milking will beat anything in the long run. So she is here milking by hand. That is the cheapest machine made. It shows here one of her faithful milking cows. 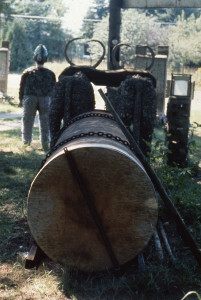 Smith continued his narrative of local history and his demonstration––with real objects––how work was done in Hans Everson Kerosene Wagon (site plan #13). 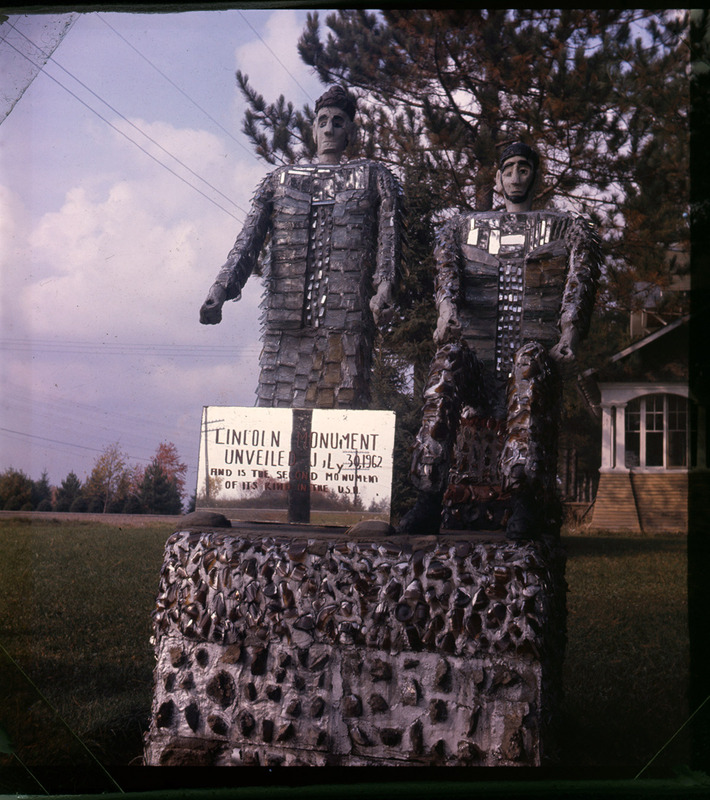 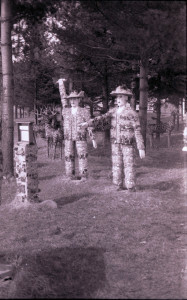 Two figures stand near the accompanying information Marker. 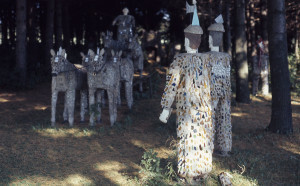 The male figure points to the Marker, directing attention to the tableau’s narrative: Here is the power that came after the oxen, which is horses. 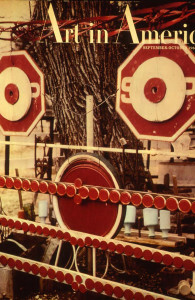 They were used for heavy logging and large tow wagons and heavy tanks. 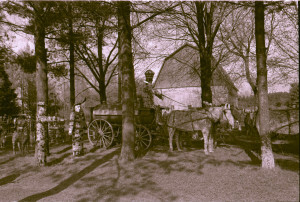 A local man of Phillips, Hans Everson, delivered kerosene and Red Crown gasoline to Fifield and Park Falls and Back to Phillips with the tank shown here from 1901 to 1915, and also took in Prentice and Catawba.Smith used the actual kerosene wagon used by Mr. Everson, and topped the large figure of Everson with a Standard Royal Crown gasoline globe for a hat. 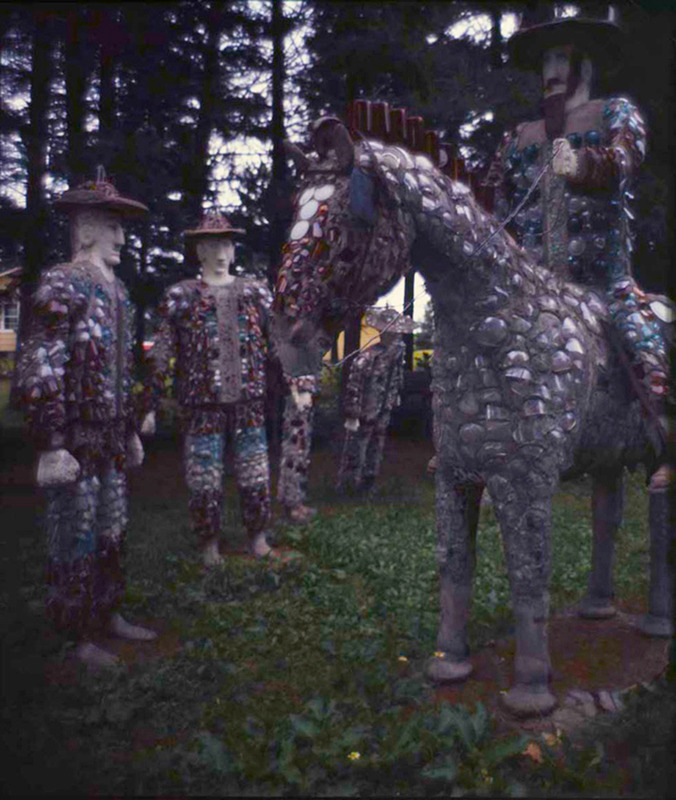 The horses in this tableau break from the rigid frontality of many of Smith’s sculptures. 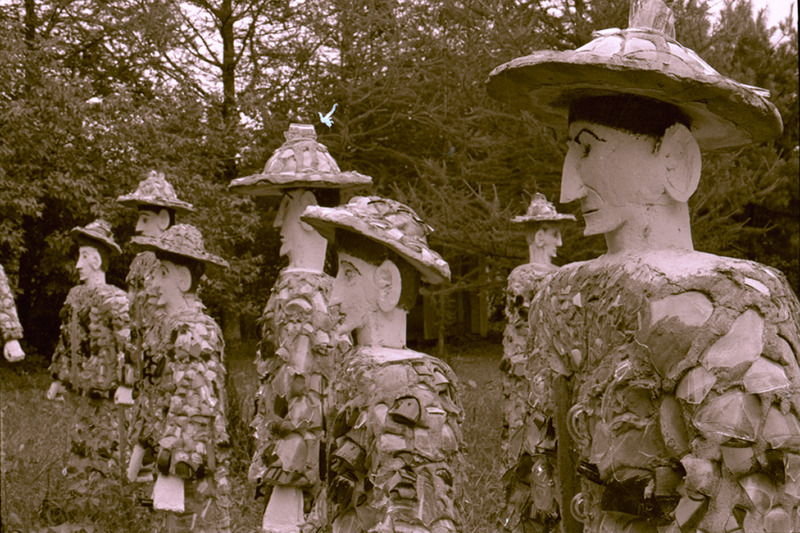 Their heads, turned in unison, appear to be glancing at something that just made a sound. 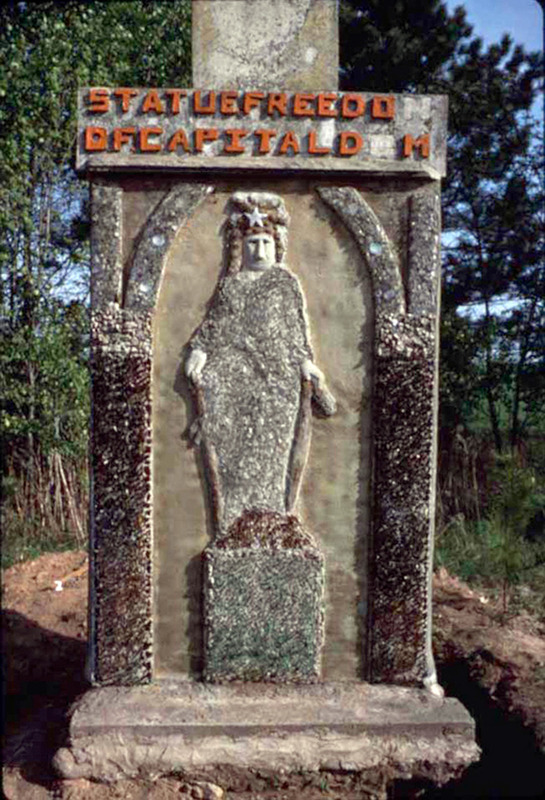 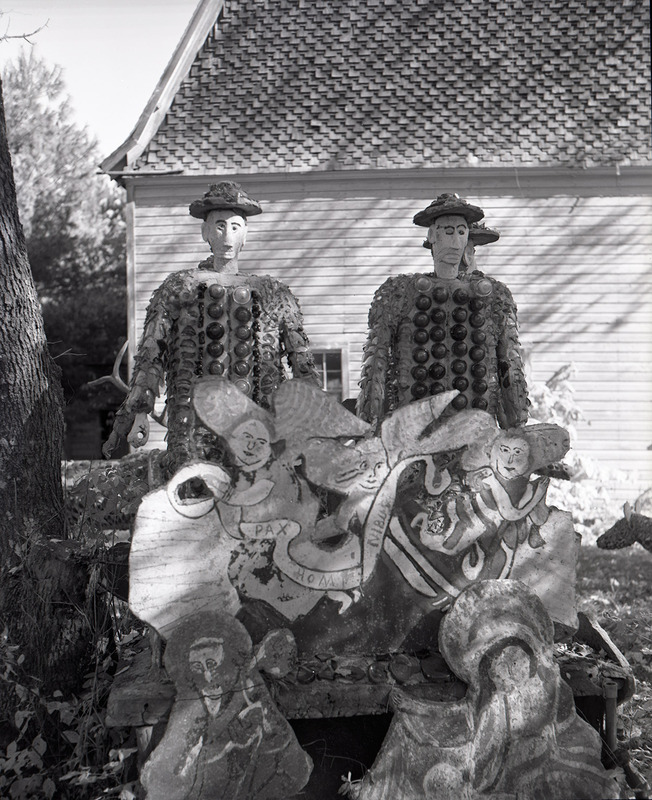 Smith continued to build commemorative sculptures after his early plaques around the tavern property. 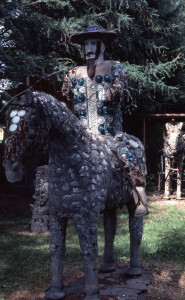 Kit Carson on his rearing horse (site plan #17), greets visitors as they enter from highway 13. 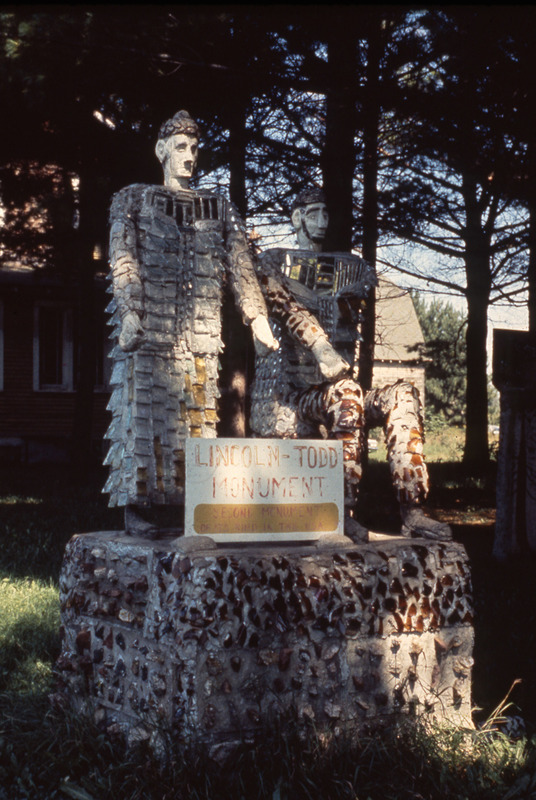 Smith’s monuments to heroes and ideals­––Abe and Mary Todd Lincoln (site plan #57) and the American Eagle(site plan #26)––were elevated on pedestals; sculptures of common people stand right on the ground. 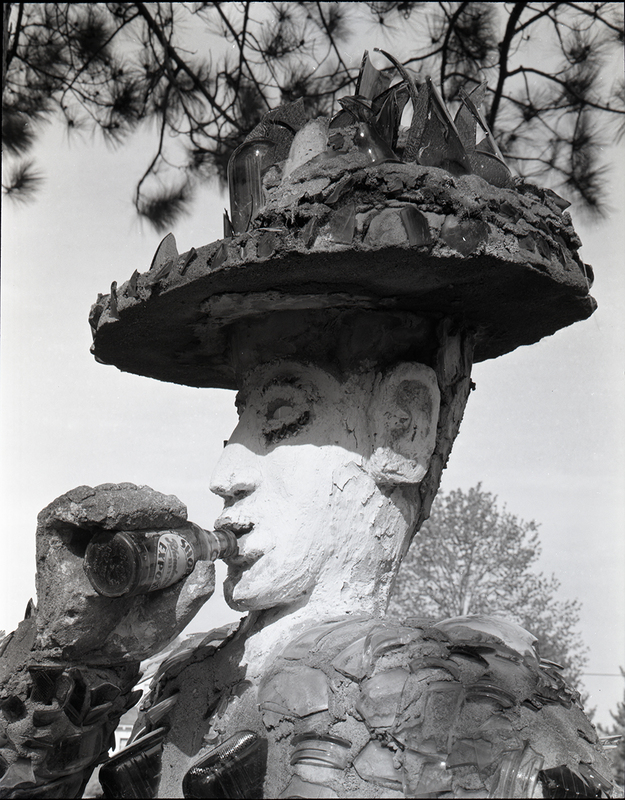 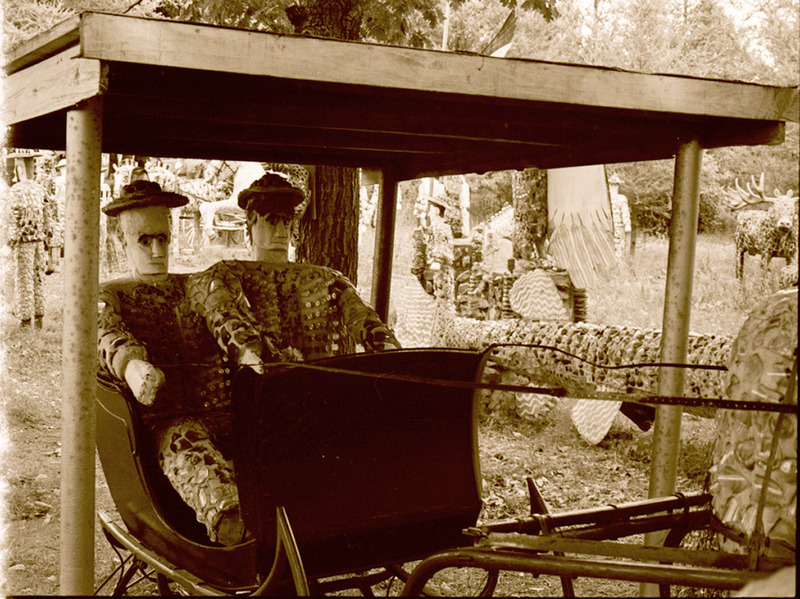 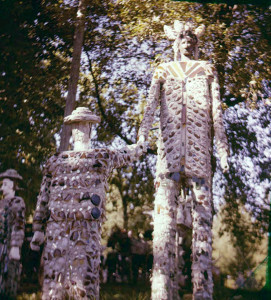 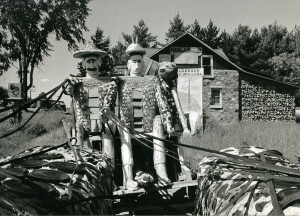 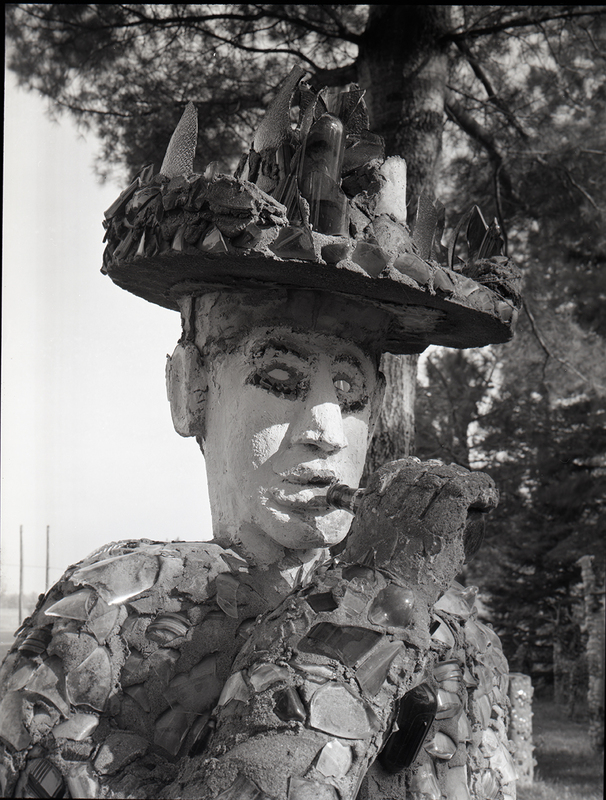 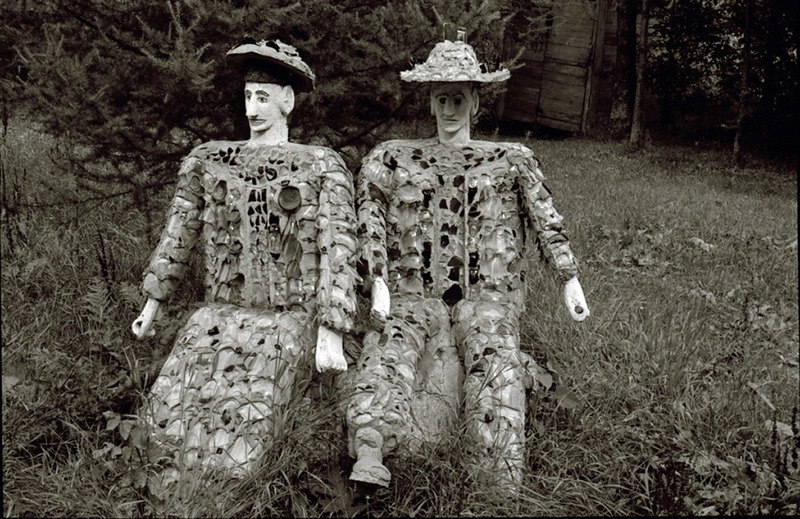 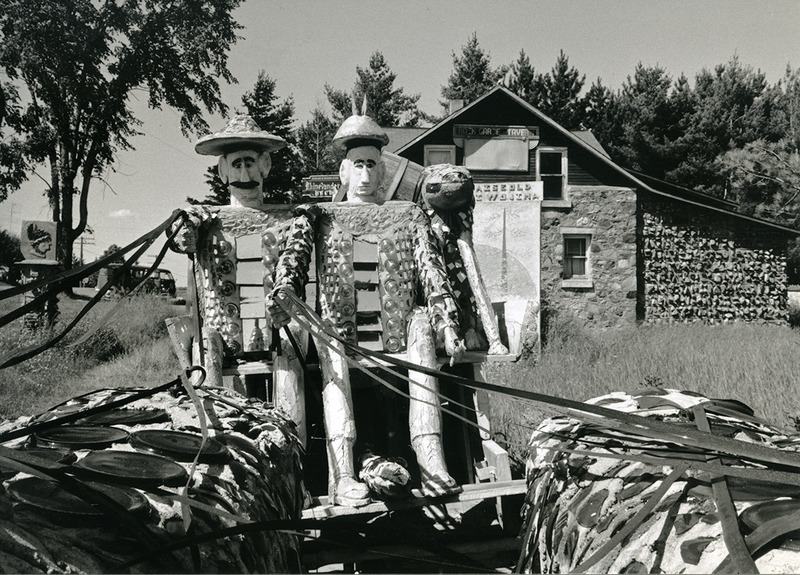 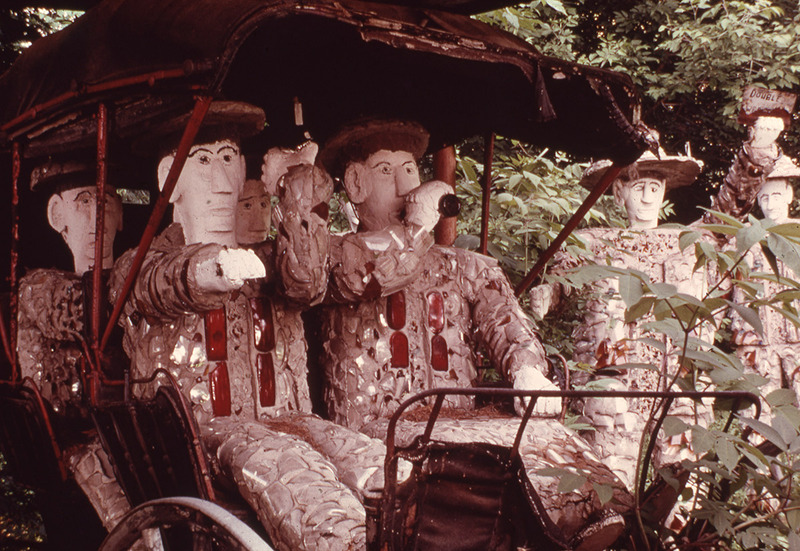 Smith made sculptures of daily life, people being people: sweethearts sitting on a rock, two couples in their Double Wedding carriage, a bandstand of musicians, a photographer, “Chiann” (Cheyanne) the cowboy beer drinker, and a sour-faced couple in a sleigh. 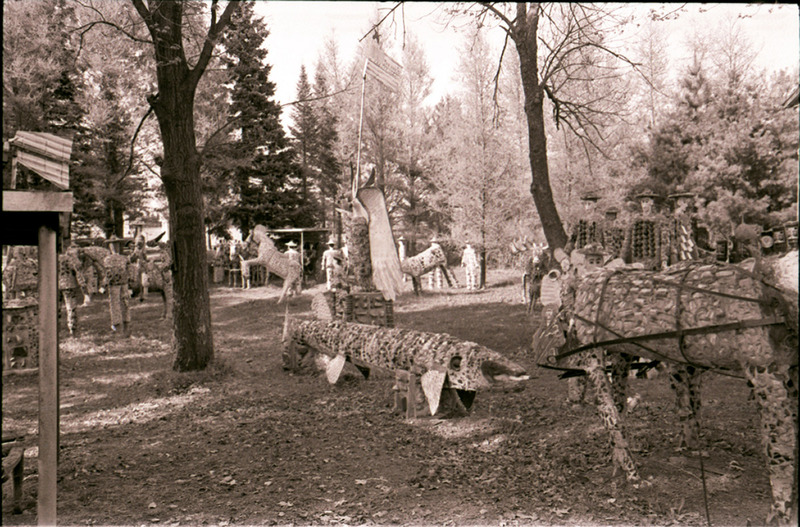 Another tableau, Muskie Pulled by Horses (site plan #27), was inspired by Tavern talk. 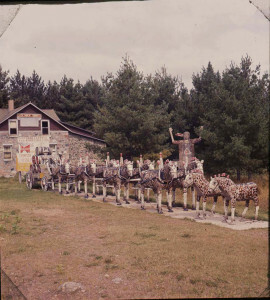 Saying he had caught the biggest Muskie, Smith said his catch was so large it had to be pulled out of Soo Lake by a team of horses. 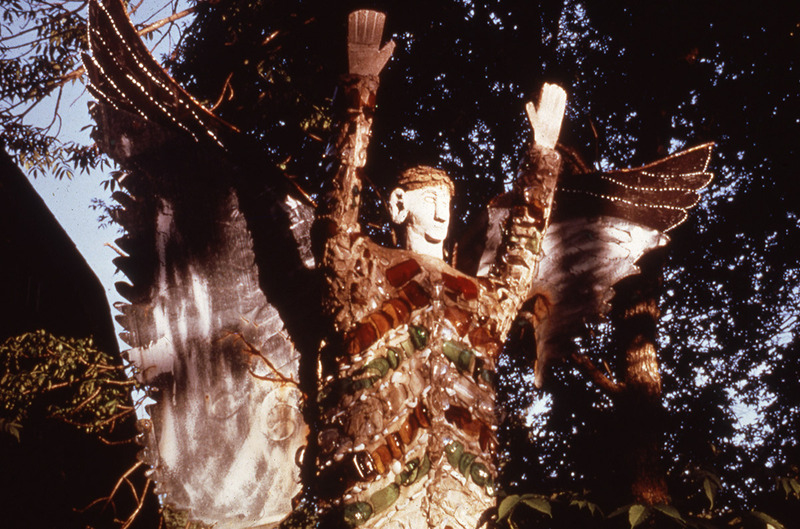 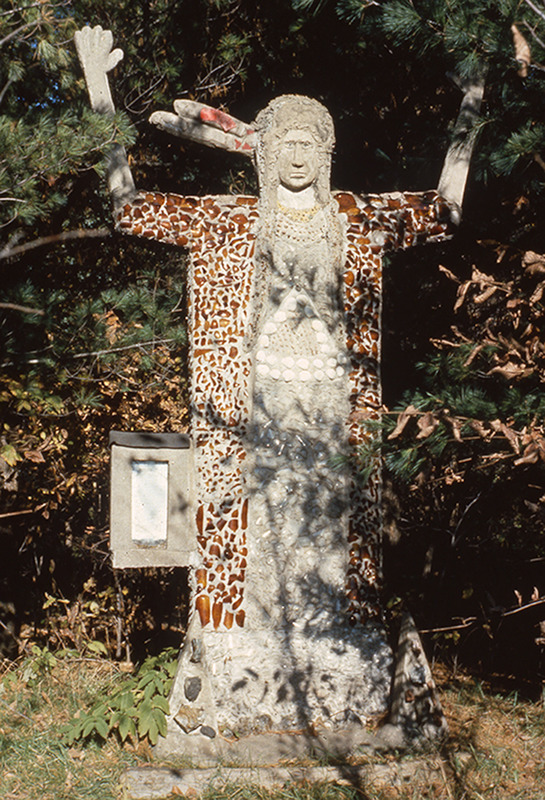 Departing from local history and legends, Smith noted spiritual or mystical aspects of life with his Angel with a Woman holding flowers at its feet (site plan # 25) and in a Silent Spot (site plan #51) for quiet meditation. Smith’s inspiration for From the Movie Ben Hur (site plan #55) came from seeing one of the films adapted from Lew Wallace’s novel Ben-Hur––spectacular chariot races happened in both versions. 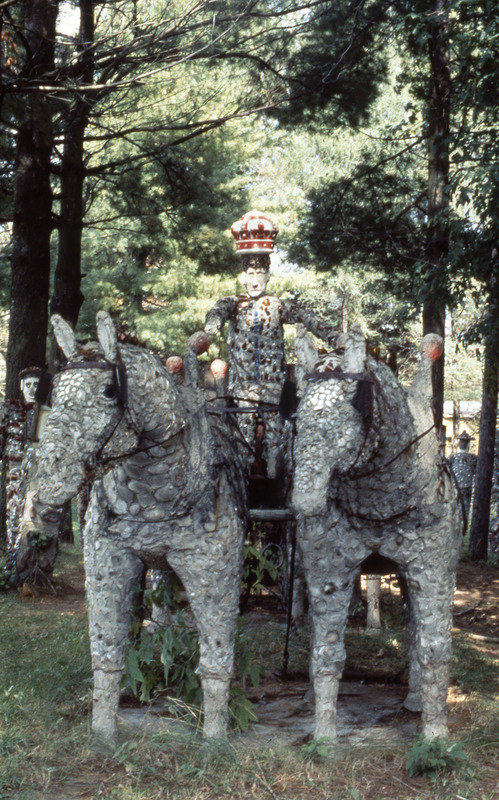 Smith included both male and a female centurions attending the charioteer–consistent with his representation of male and female figures throughout the rest of the Park. 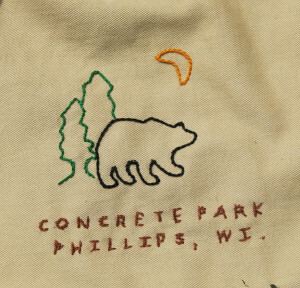 During the fifteen years that Smith created the Wisconsin Concrete Park he suffered from extreme arthritis. 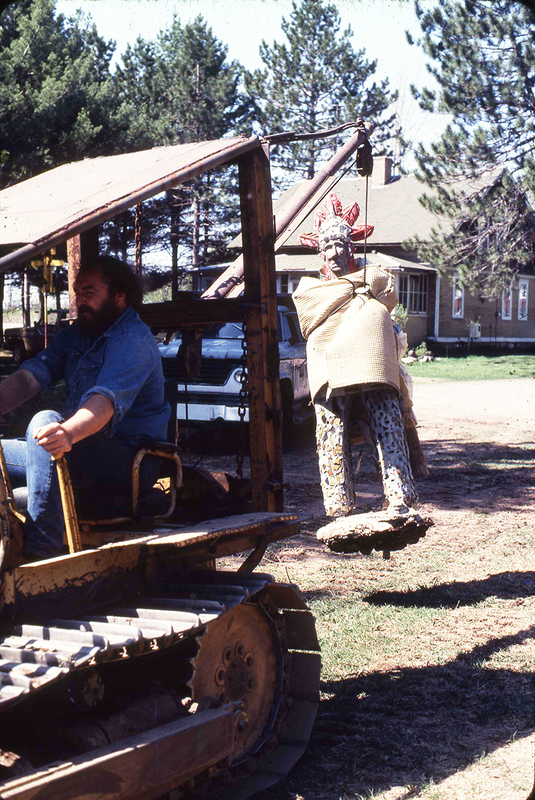 This didn’t slow him down. 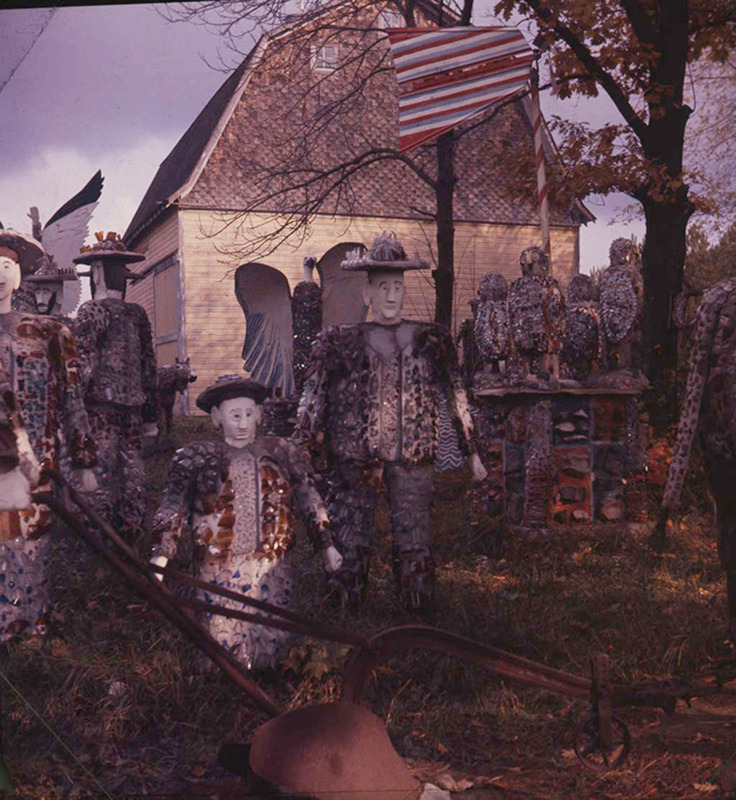 Smith’s last tableau was one of his most ambitious projects, requiring about six months to complete. 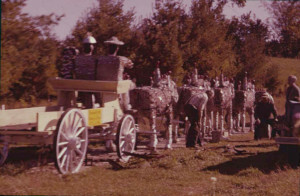 The Budweiser Clydesdale Team, with its eight draft horses and two ponies, originally had two figures and a dog seated on the wagon. 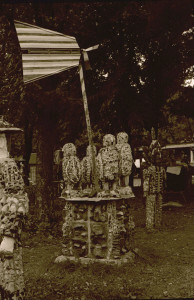 The two figures are no longer intact; the dog now sits at the head of the team. 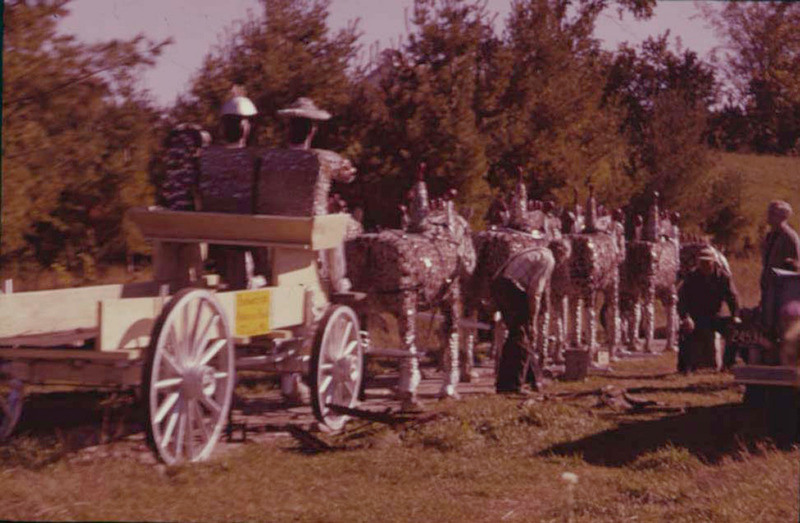 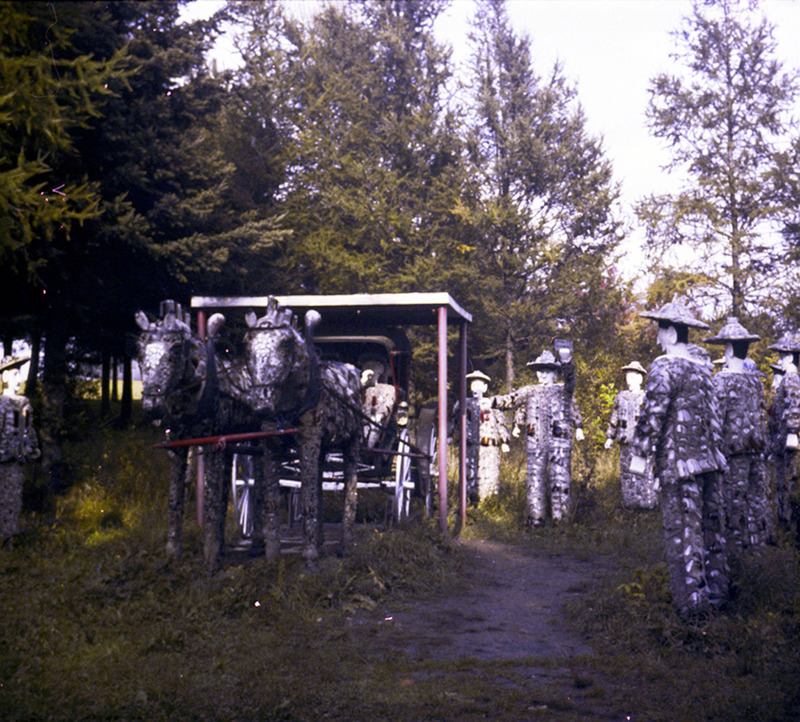 Smith built the Budweiser Clydesdale Team directly south of his Rock Garden Tavern. 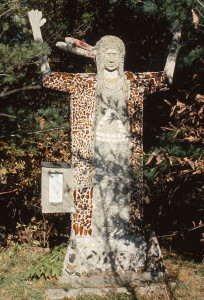 Sacajawea was sheltered in the trees nearby, facing west–the direction she signifies. 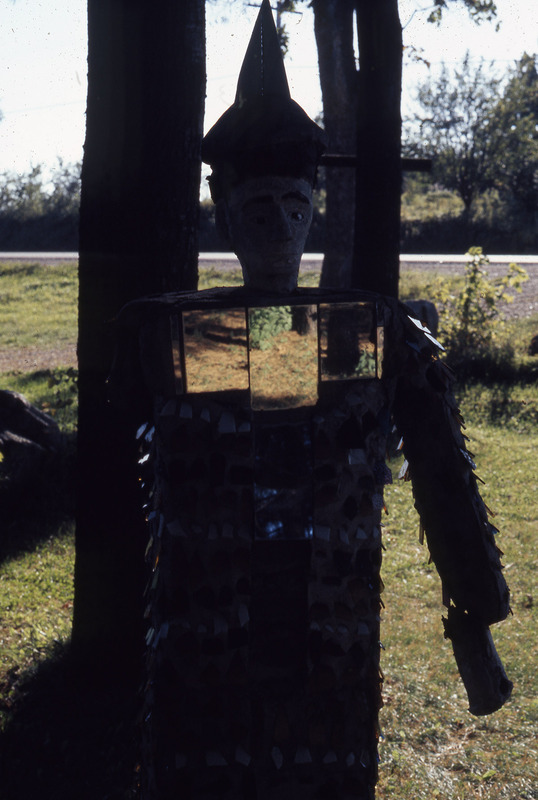 People approaching from the south on Highway 13 had cause to gasp and pull over. 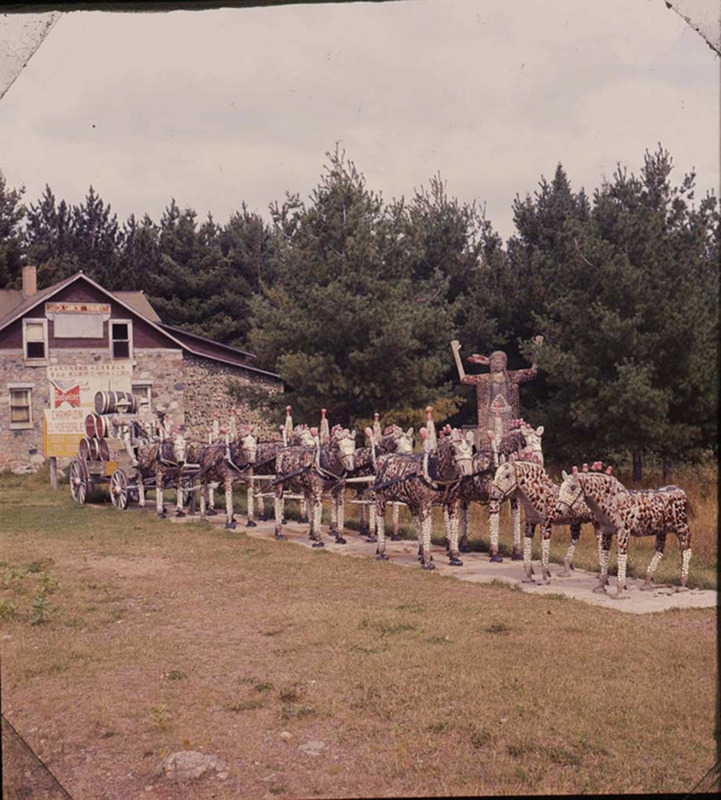 The Budweiser Clydesdale Team announced something extraordinary in the northwoods– and it wasn’t just beer. 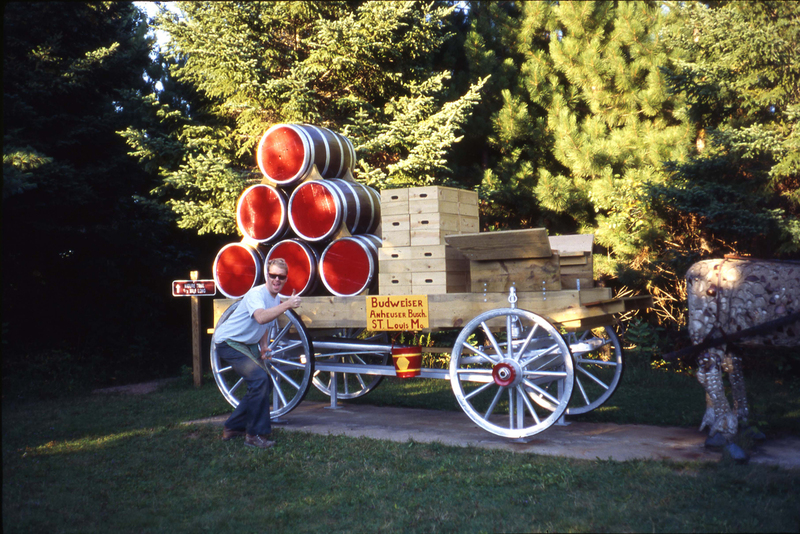 Fred Smith constructing the Budweiser Display, site plan #45. 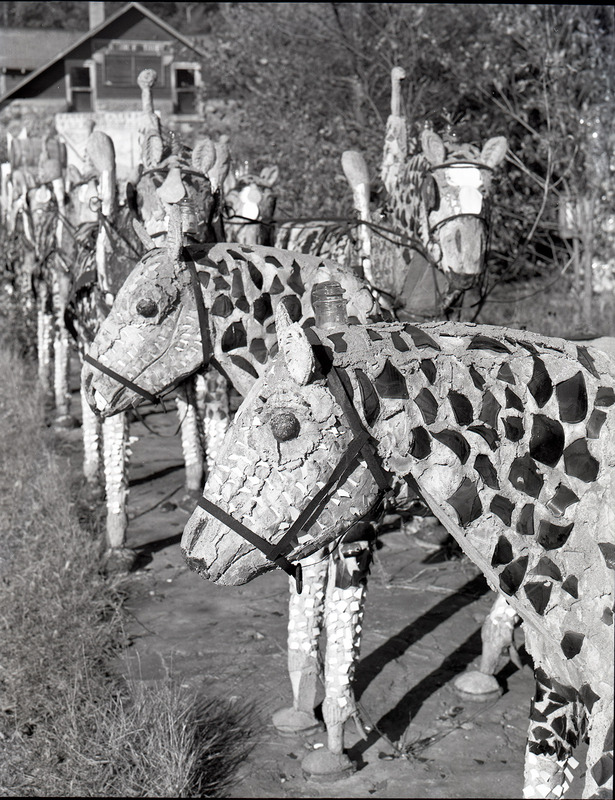 Photo: Robert Amft, 1964. 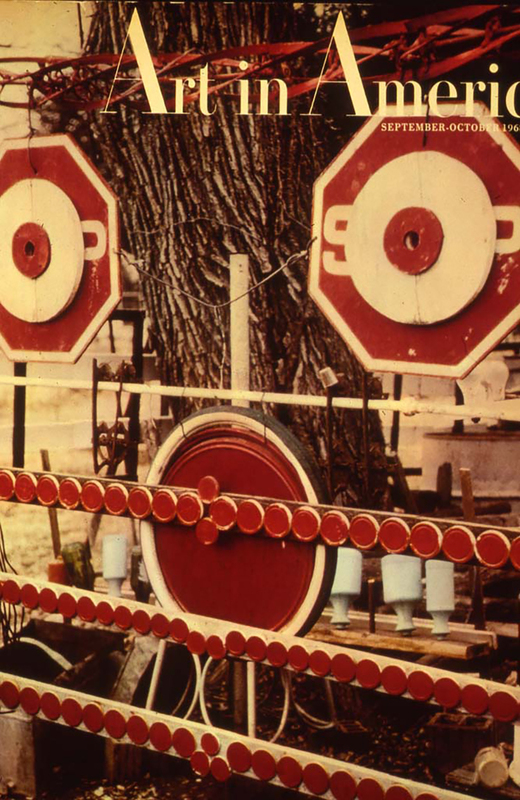 Budweiser Display, site plan #45. 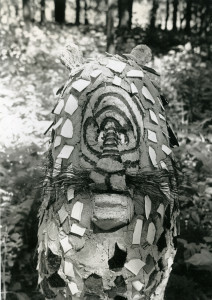 Photo: Robert Amft, 1964. 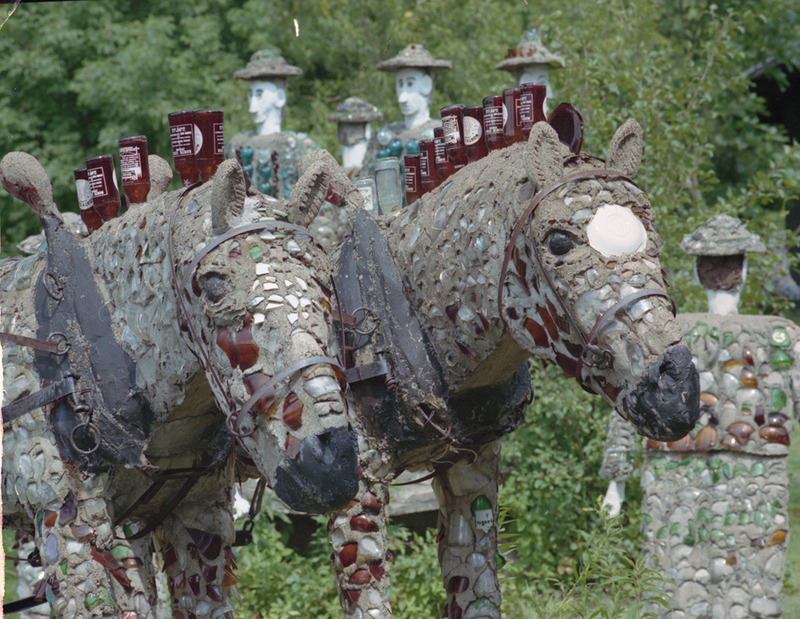 Shortly after Smith finished the last horse in his Budweiser Display, he suffered a stroke. 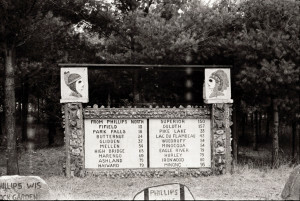 He was moved to a rest home in Phillips, not far from the Park. 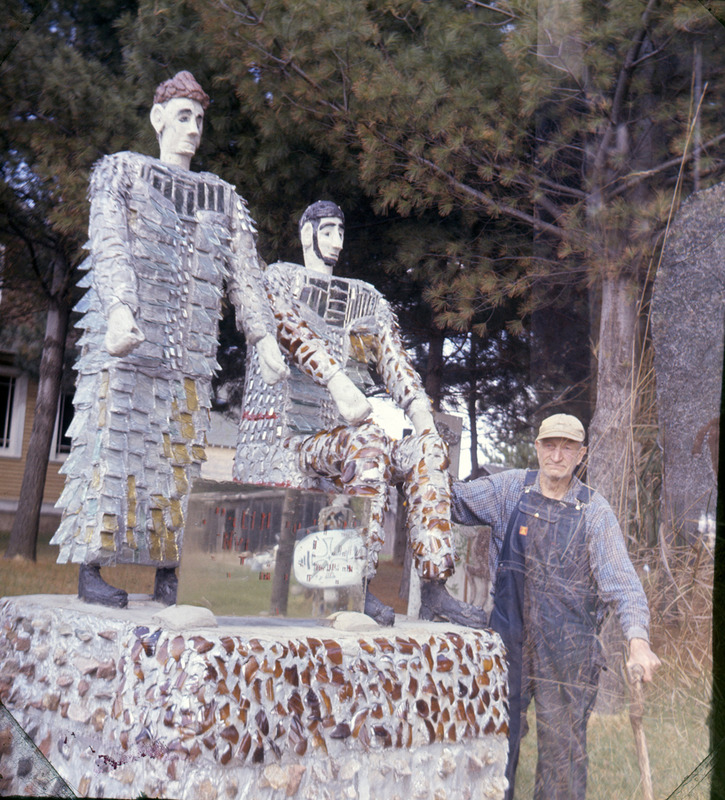 He spent eleven years in the rest home, dreaming of sculptures that he could no longer build. 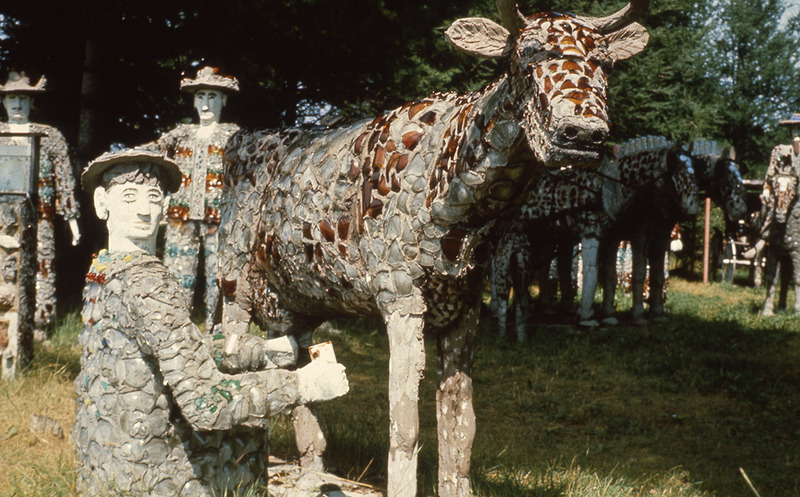 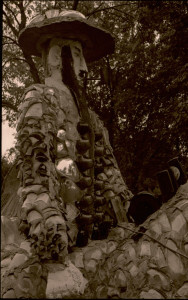 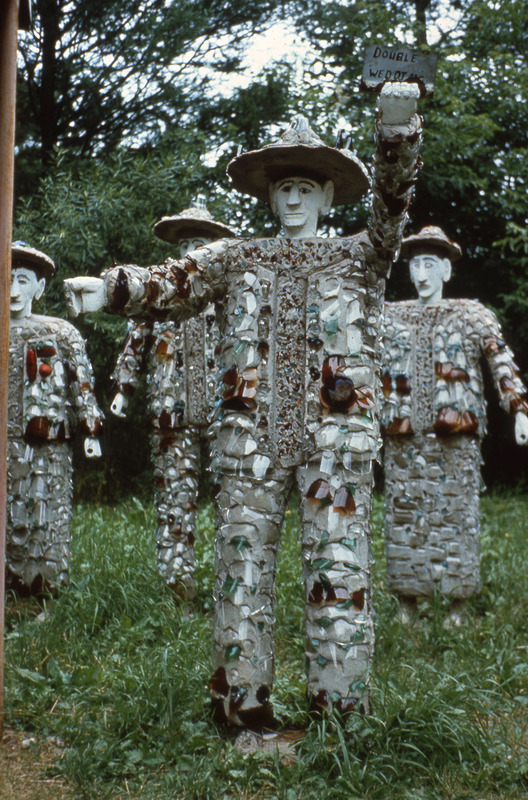 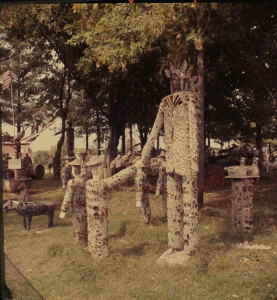 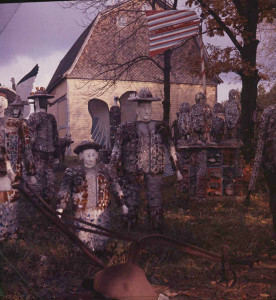 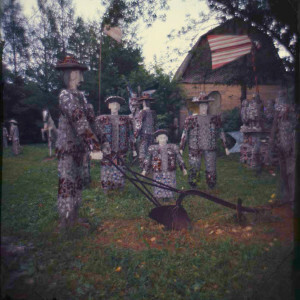 In 1968 the Wisconsin Concrete Park was one of 15 art environment builders featured in the article “Grass-Roots Art” by Gregg Blasdel, in the September/October issue of Art In America. 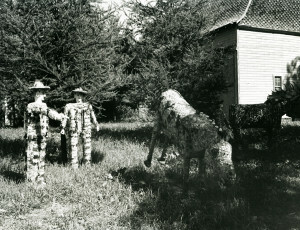 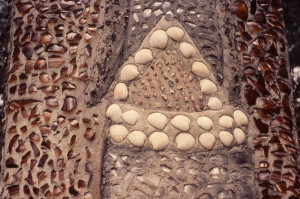 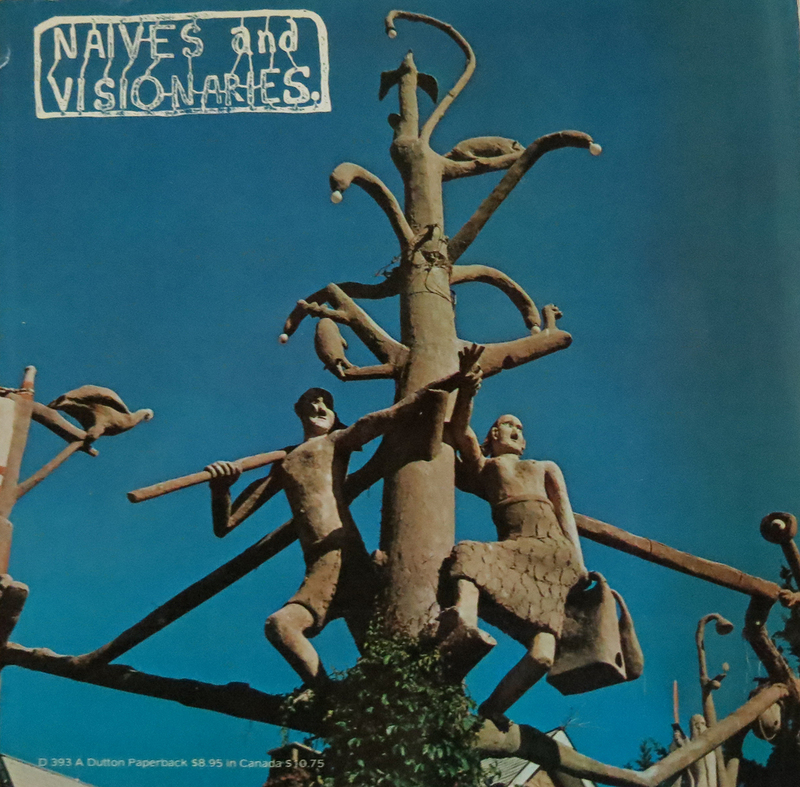 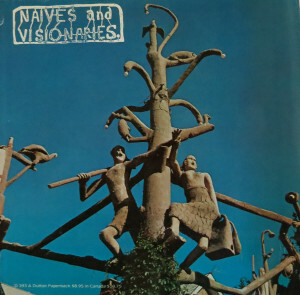 In 1974 the Walker Art Center (Minneapolis) organized the exhibition Naives and Visionaries, the first museum exhibition to feature works by self-taught environment builders. 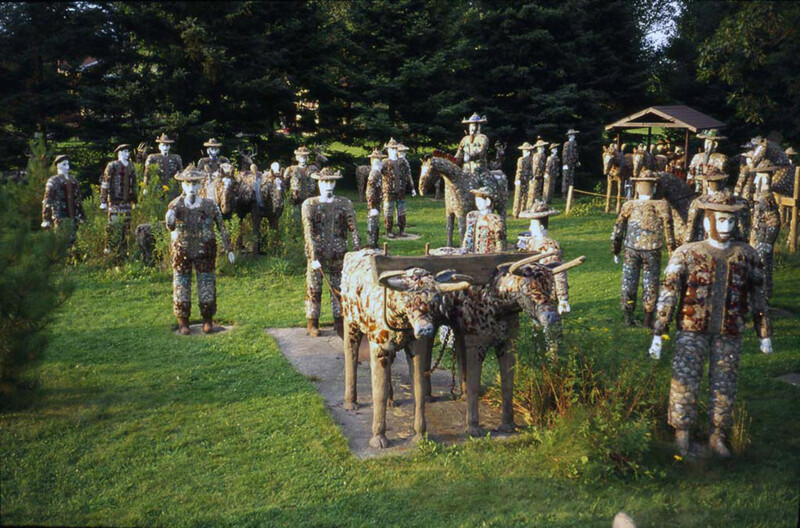 The curators begged Smith to borrow a few sculptures from the Park. 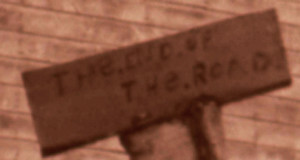 Fred refused. 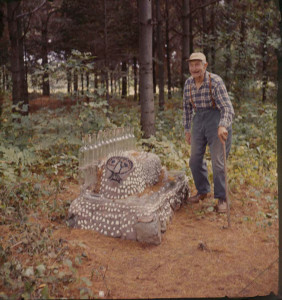 He insisted that people had to see his artwork exactly where it was made, where it belonged. It was already in a museum, it was a museum. 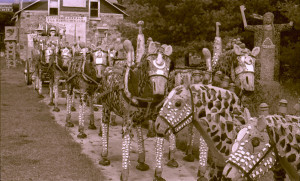 The future of the Park was uncertain. 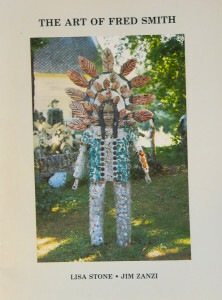 Jim Zanzi, artist/educator and friend of Fred’s, urged the Smith family to loan a few works, so the art of Fred Smith could receive museum and art world recognition. The Black Panther (site plan 29) and child figure from Farming with Horses (site plan #11) were moved and shown with beautiful photos of the site. 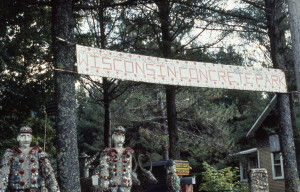 Fortunately, Fred Smith’s Wisconsin Concrete Park outlived its builder. 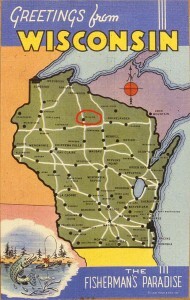 In 1976 the site, exclusive of the tavern and its surrounding property, was purchased by Kohler Foundation, Inc. of Kohler, WI. 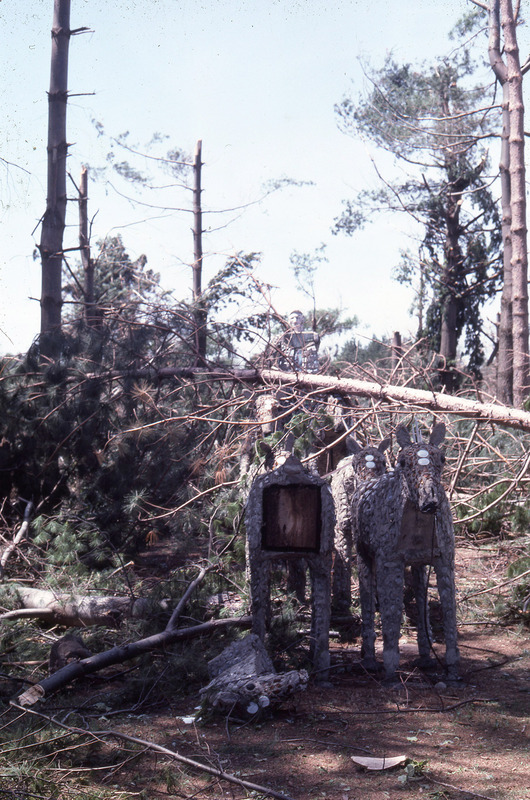 A restoration project was begun in the spring of 1977. Since the tavern was not purchased, all but one sculpture on the tavern property (and a few tableaux from the site-proper) were moved and reinstalled in the present east meadow. 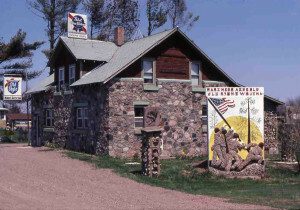 The owner of the Rock Garden Tavern wanted the Iwo Jima monument to remain. 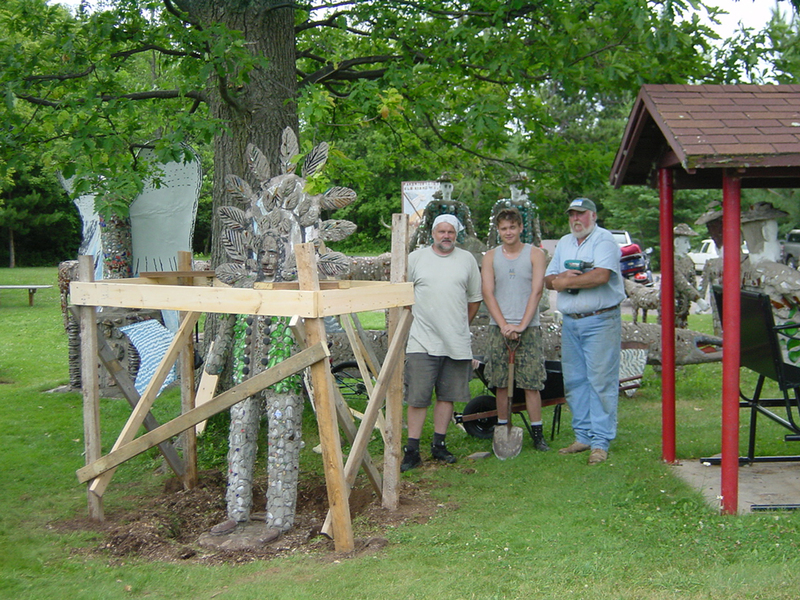 Artists Don Howlett and Sharron Quasius were hired to move and repair sculptures and prepare the site to be a Price County Park. 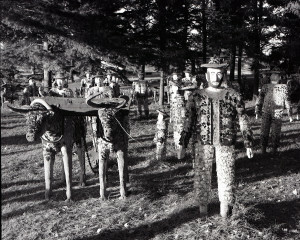 They began work in spring 1977. 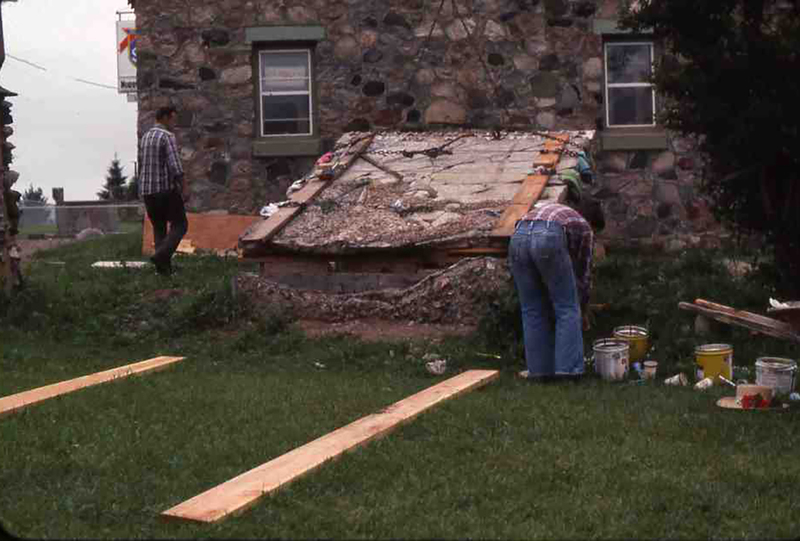 Don and Sharron were well into the project when a devastating cyclonic downburst hit Price County and wreaked havoc on the Park. 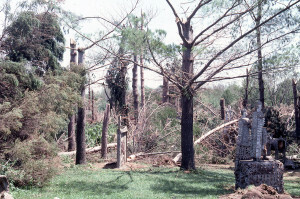 Most of the large growth trees, which were integral to the landscape, were destroyed. 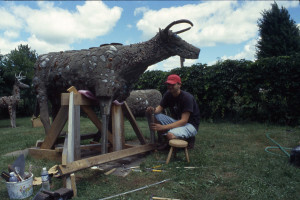 The site required a major restoration. 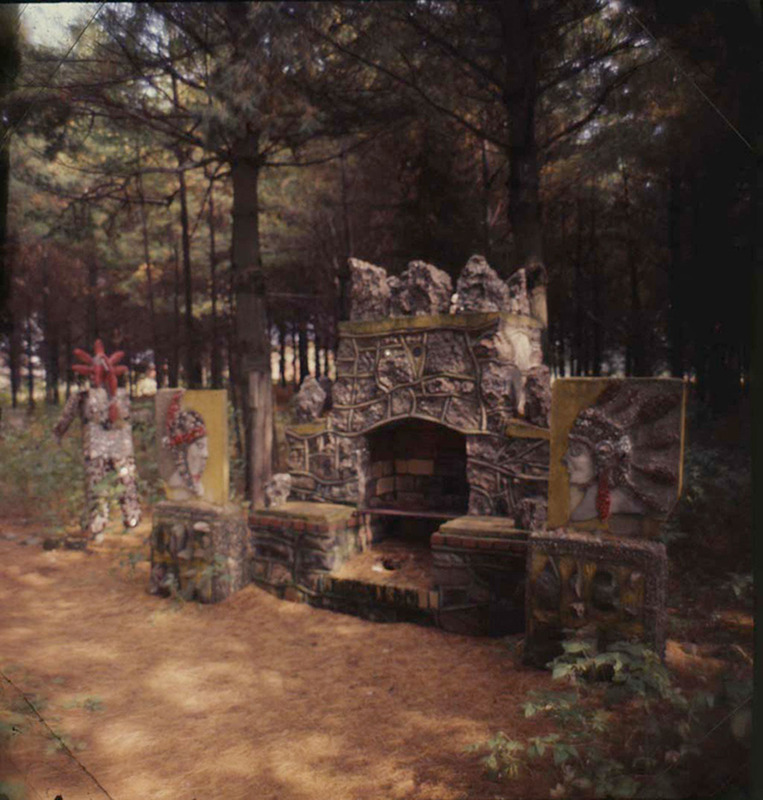 The grounds first had to be logged off. 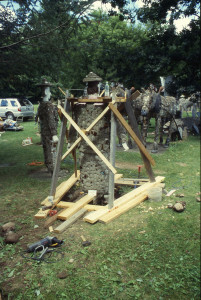 Many sculptures were repaired, and most received new concrete footings. 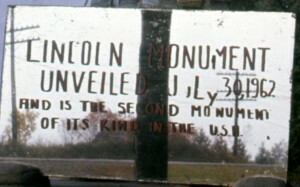 The project was completed in September 1978. 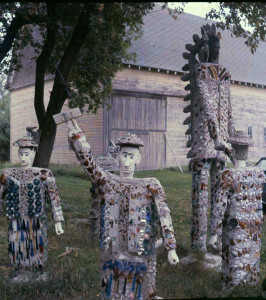 The site was gifted by Kohler Foundation, Inc., to Price County as a County Park and museum. 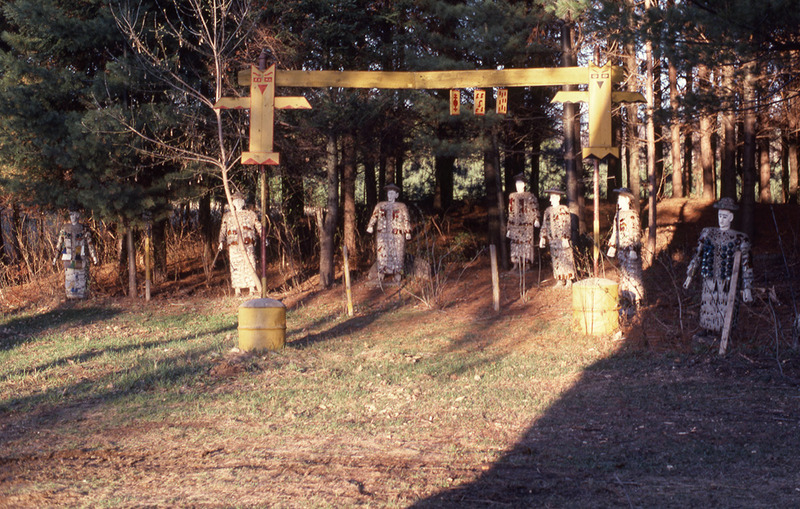 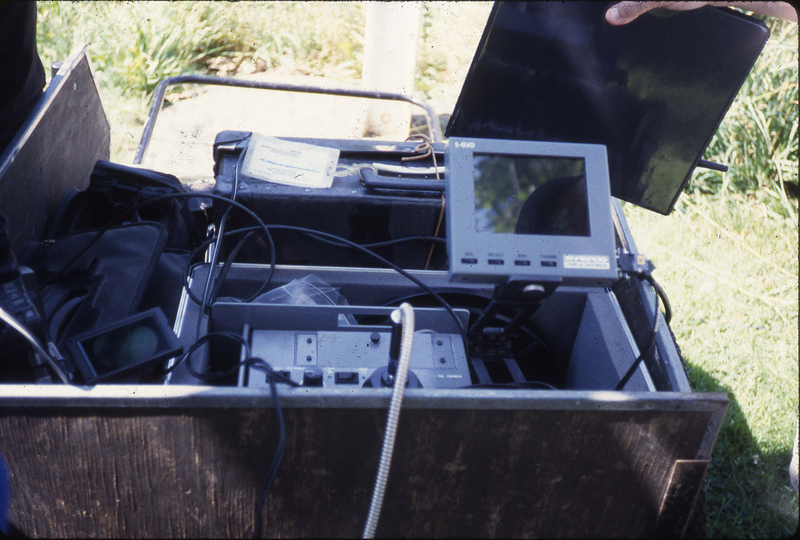 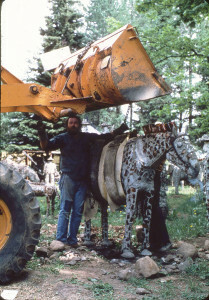 In the summer of 1987 a a site conservation and maintenance project was underway. 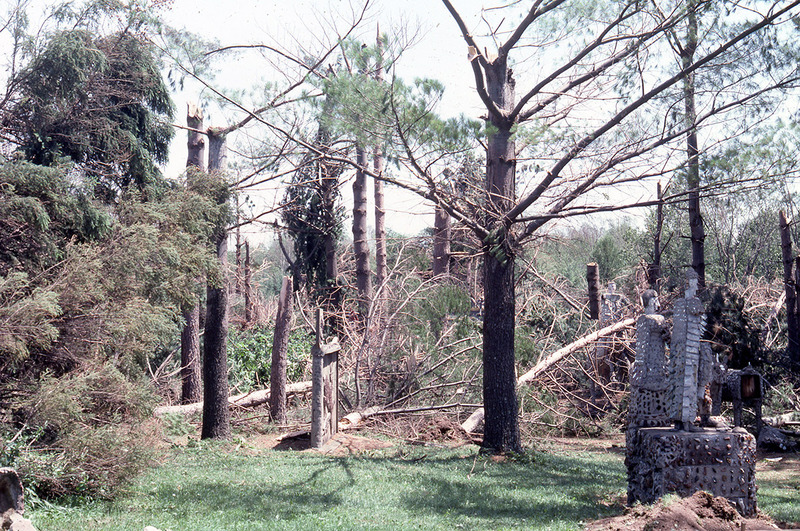 On July 4, exactly ten years after the first windstorm, a second storm struck the region and the Park. Repair of storm damage precipitated an annual maintenance program. Preservation of the sculptures, house and landscape are now ongoing activities. 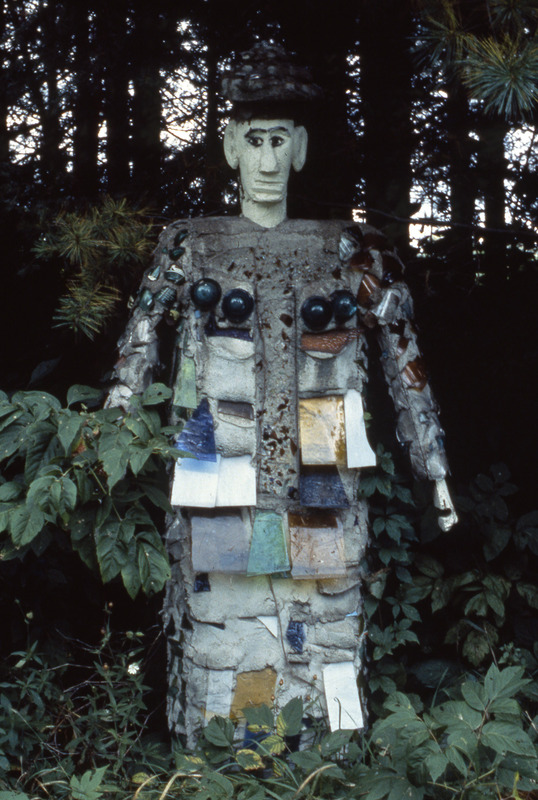 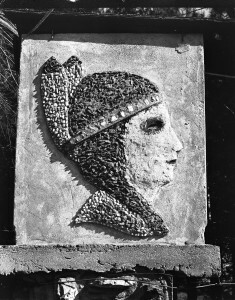 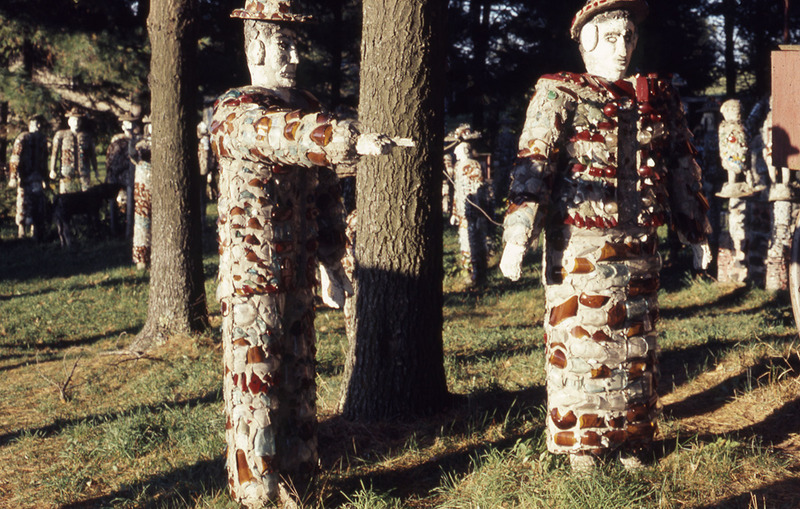 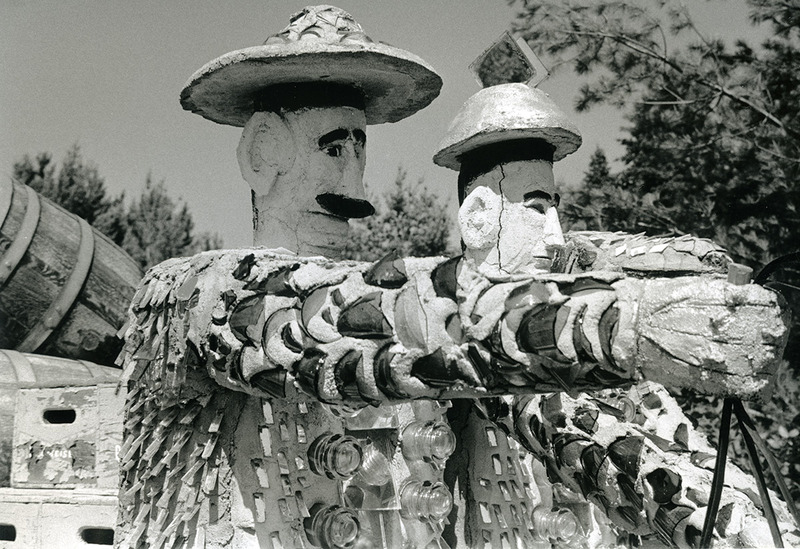 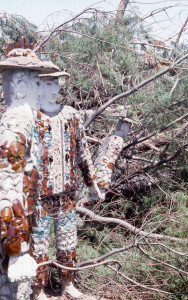 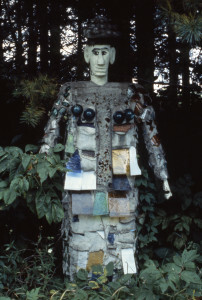 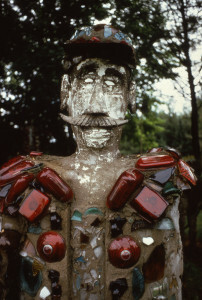 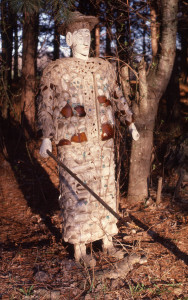 Preservation activities strive to maintain the sculptures, house, and landscape as integrated entities, as close as possible to their original state and context, during the time period of Fred Smith’s artistic activity, 1948 – 1964. 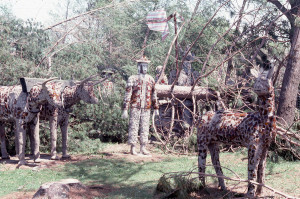 See the Conservation section for additional information. 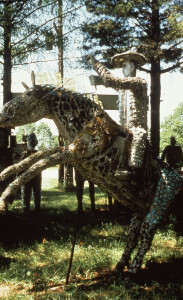 For additional history please explore The Artist and The Friends sections. To see images of the site today, please explore Photos. 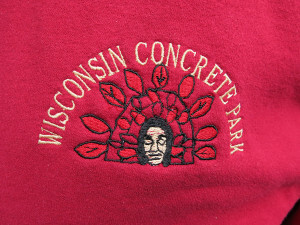 The Wisconsin Concrete Park is located at N8236 South Hwy 13, just south of Phillips, in Price County, Wisconsin. It is open to the public year round during daylight hours. 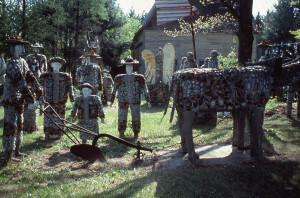 There is no admission charge but donations for site preservation are appreciated. 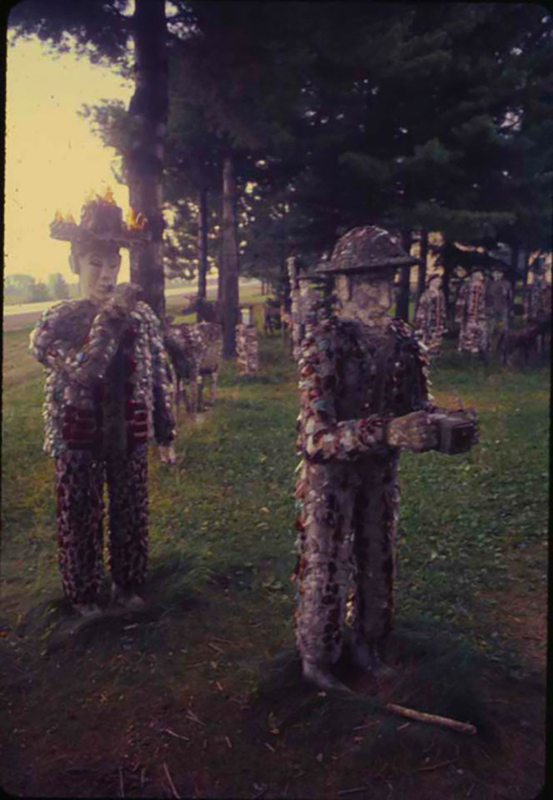 Self-guided tour brochures are available on site for a donation, and a more in-depth history and self-guided tour can be found in the book The Art of Fred Smith. 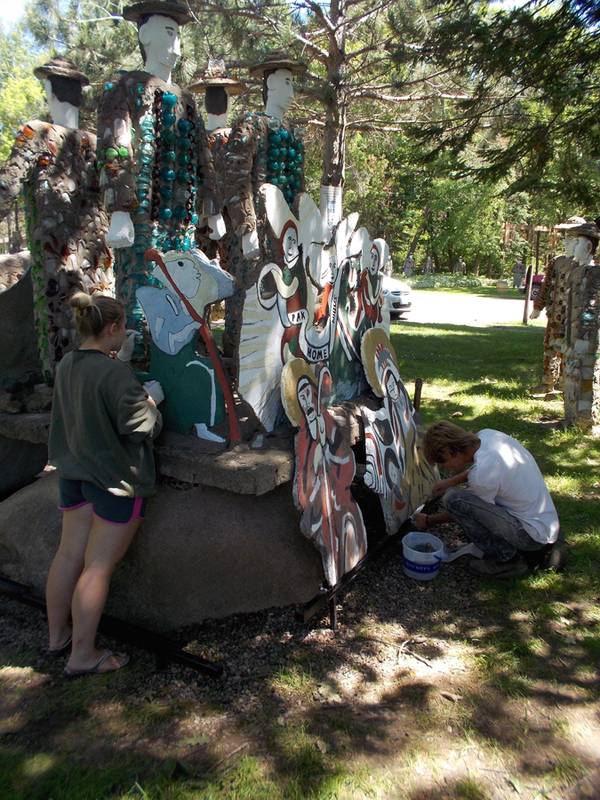 May 27 – October 30, daily, 10:00 a.m. – 4:00 p.m.
Handcrafted works by local artists and including mosaic art, jewelry, woodwork, concrete crafts, hand painted canvas with inlaid picture frames, fiber arts and crafts (purses, hats, mittens, scarves, etc. 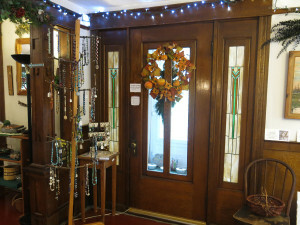 ), quilted items, sheepskins, floral decor, greeting cards, baskets, aprons and much more. 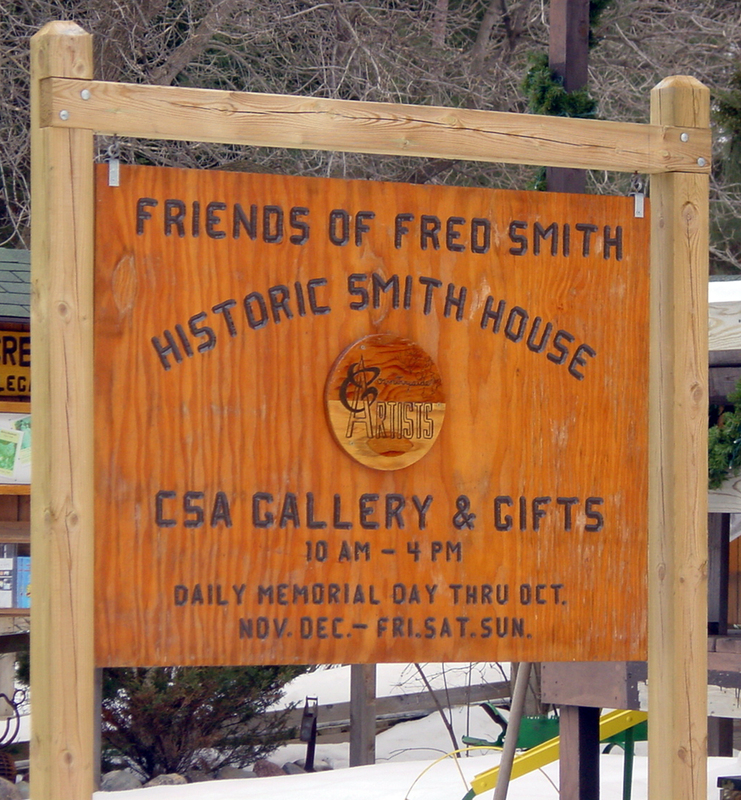 Friends of Fred Smith merchandise: t-shirts, ball caps, ceramic statues, postcards, note cards, The Art of Fred Smith, Marines Raise Old Glory on Iwo Jima (both by Lisa Stone and Jim Zanzi), and WCP Stormy Kromer hats! In 1976 preserving art environments in the U.S. was in its early beginnings. 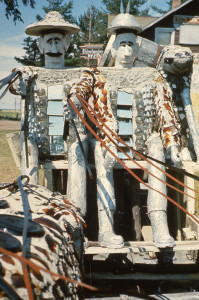 The preservation of Sabato (Sam or Simon) Rodia’s Watts Towers in Los Angeles began in 1959. 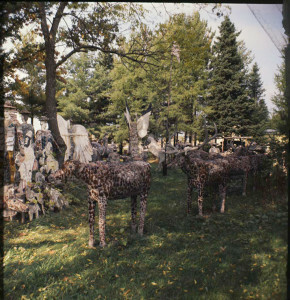 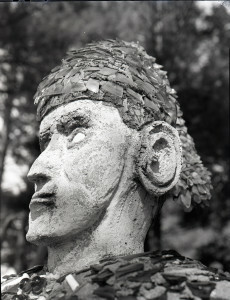 The Wisconsin Concrete Park became the the second major art environment in the country to be recognized and preserved. 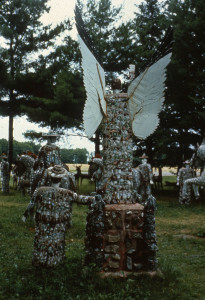 Shortly before Smith’s death in 1976, the site was purchased by Kohler Foundation, Inc. (KFI), of Kohler, Wisconsin, Kohler Foundation, Inc. KFI funded a restoration project in 1977 that initially addressed cosmetic and few structural elements of Smith’s sculptures. 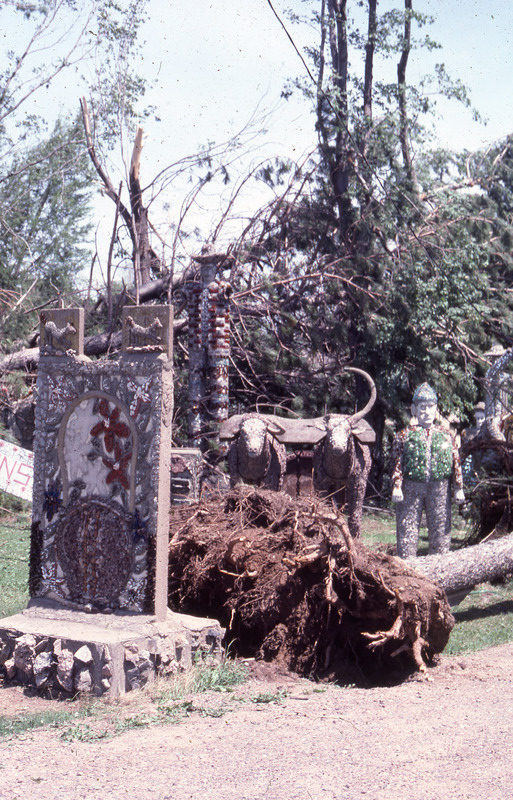 Then, on July 4 of that year, the fierce windstorm that struck Price County, caused tremendous damage to many sculptures and most of the large-growth trees at the Park. 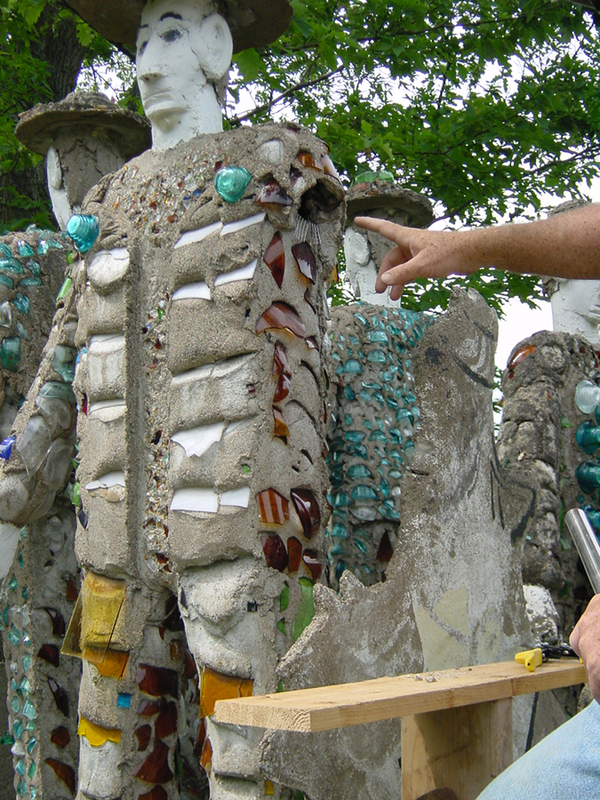 If the restoration project had not been in process, the site most likely would have been bulldozed. Artists Don Howlett and Sharron Quasius fully restored the damaged sculptures, with further assistance from KFI and emergency funds from the National Endowment for the Arts and the Wisconsin Arts Board. 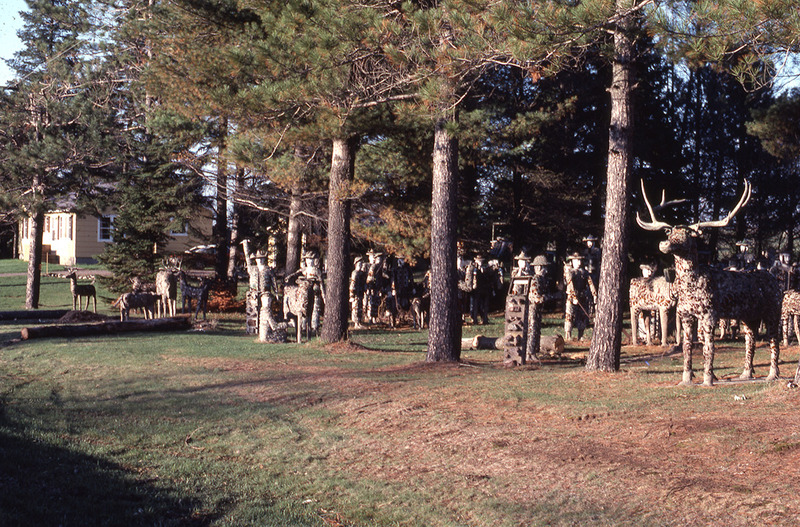 In 1978 the site was deeded to Price County by Kohler Foundation, Inc. to become a public park and museum, overseen by the Price County Forestry Department (PCFD). 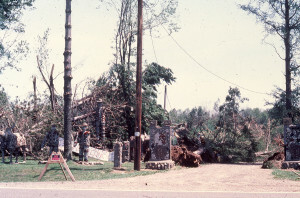 From 1978 to 1987 intermittent work was done at the site. 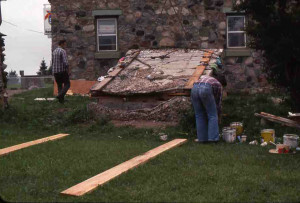 In summer 1987, with funding from KFI and PCFD, Don Howlett, Jim Zanzi, and art students to assess the site and devise a plan for annual maintenance and conservation. Then, ten years and 1 day after the first windstorm, a second storm struck the Park, causing damage to about 30 sculptures and many trees. 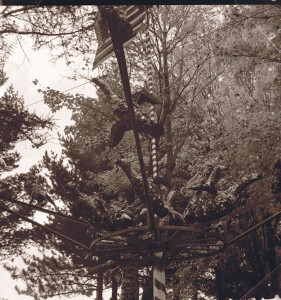 The 1987 restoration project precipitated individuals and PCFD to commit to an annual maintenance and conservation program. 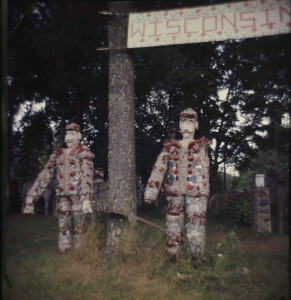 Initially funded by small grants from the Wisconsin Arts Board, private corporate donations, and many individual contributions, the funding base gradually increased over the years. 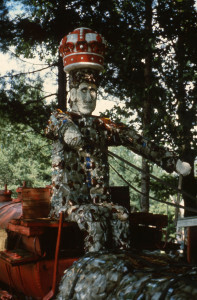 In 1994 the WCP received funding for conservation from the National Endowment for the Arts and the Intermodal Surface Transportation Efficiency Act (ISTEA) of the federal Department of Transportation. Don Howlett welding metal armature. 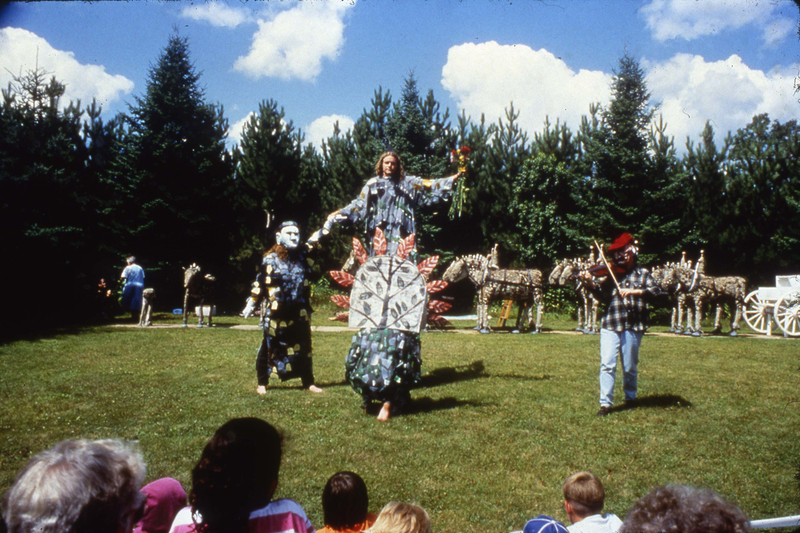 In 1993, the spontaneous creative activities of a group of artists turned the tide, and suddenly, through celebrations and theatrical performances, the Park was more fully embraced by the local community. 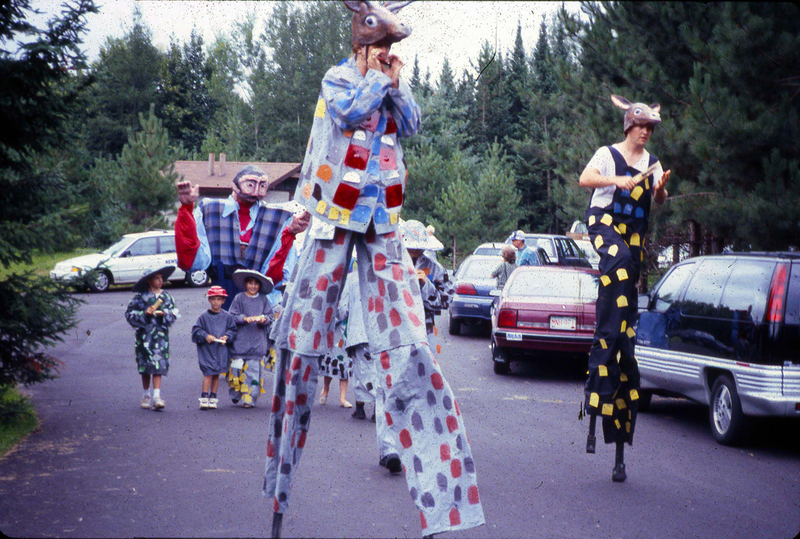 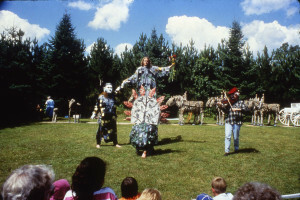 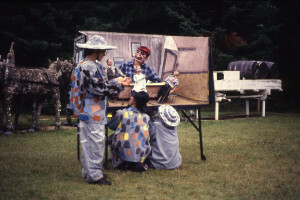 In 1994 the troupe evolved into Theatre Nana under the direction of Molly Ross, who formed the company to celebrate and ‘bring to life’ the genre of art environments. Their puppet workshops and performances further galvanized community support and the creative activities at the site. 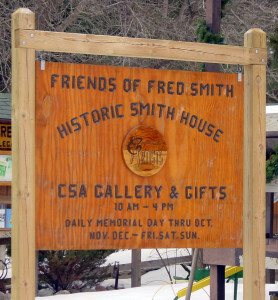 In 1995 Friends of Fred Smith (FoFS) was founded. 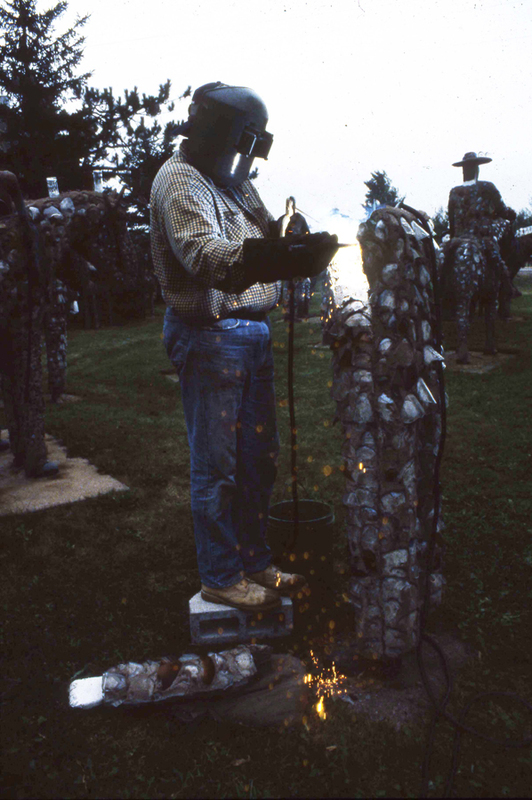 In annual projects since 1987, through conducting repairs, teams of artists and technicians in the building trades have learned much about how Smith built his sculptures and how to conserve them. 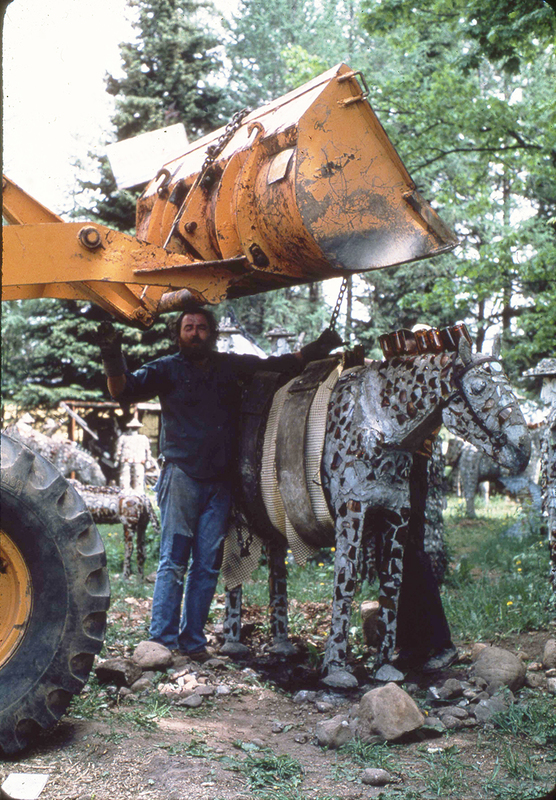 Female figure cribbed, preparing to be lifted to remove corroding leg pipes and replace with stainless steel. 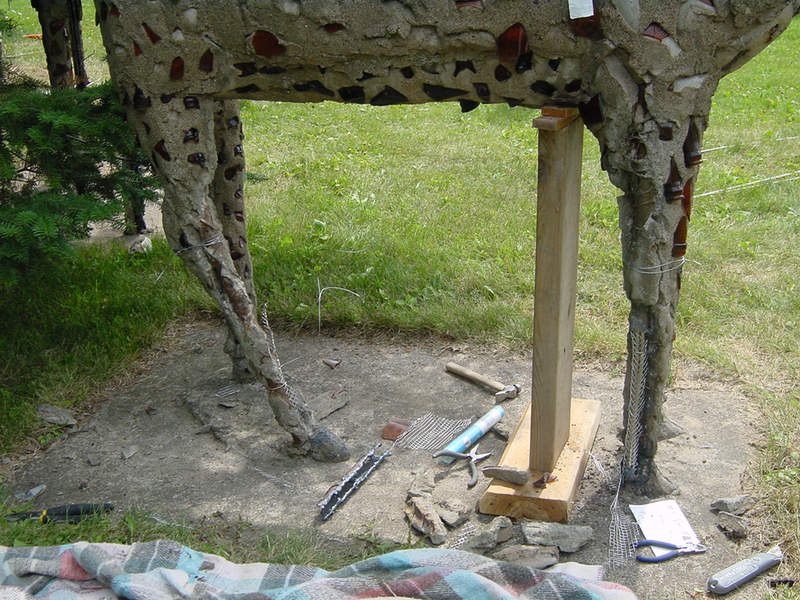 New stainless steel rods and mesh in leg repair of male figure. Stephan Niedorezo completing leg repair and re-positioning of male figure. Stephan Niedorezo re-positioning male figure. 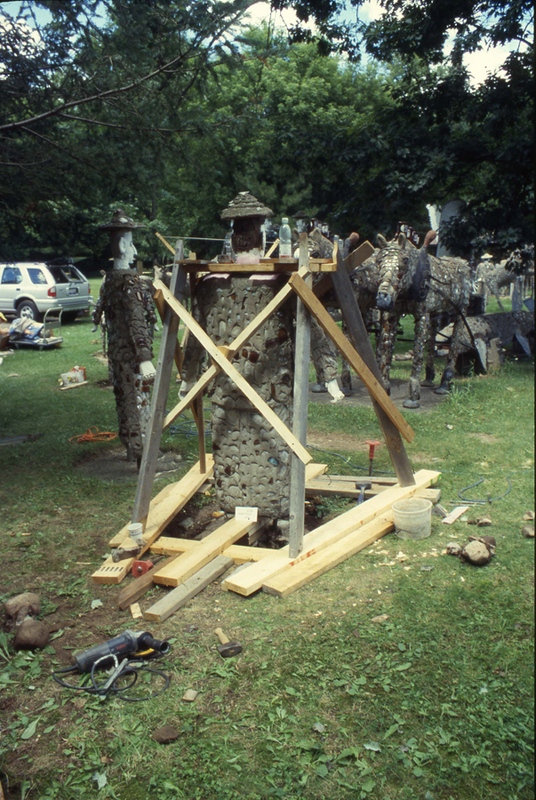 Boroscopic equipment used to view and photograph interior conditions of sculptures. 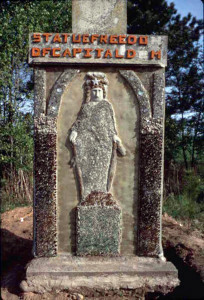 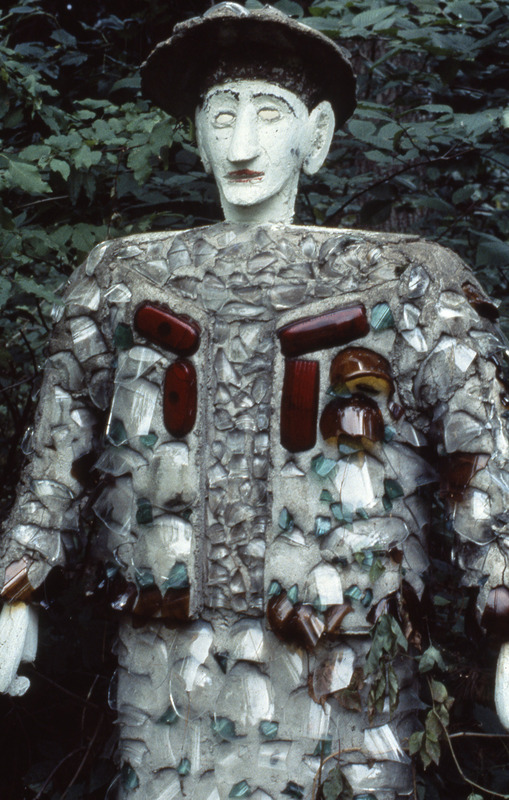 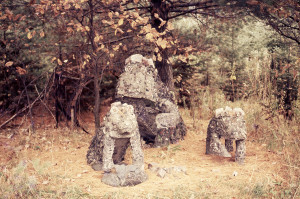 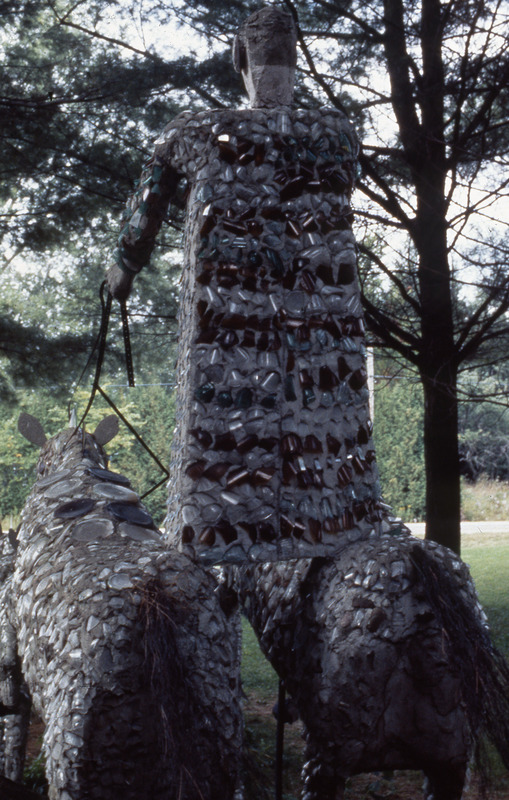 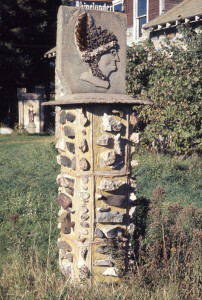 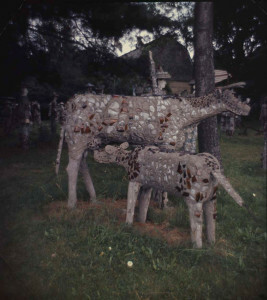 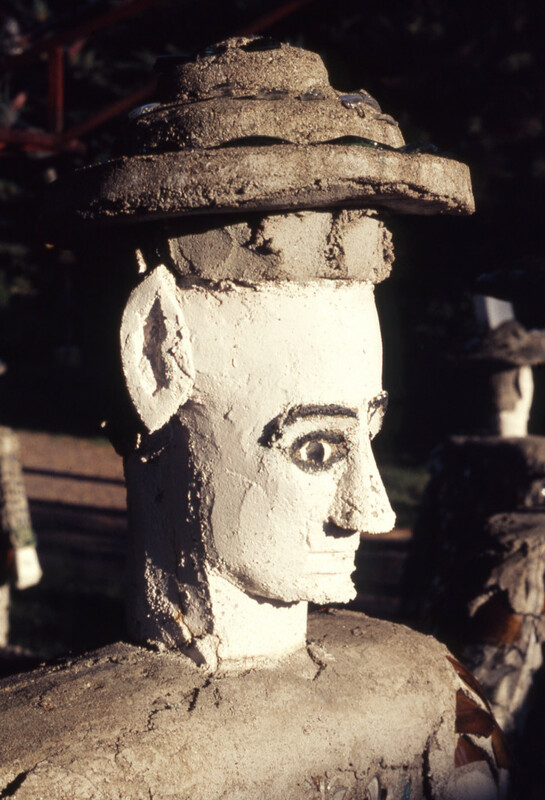 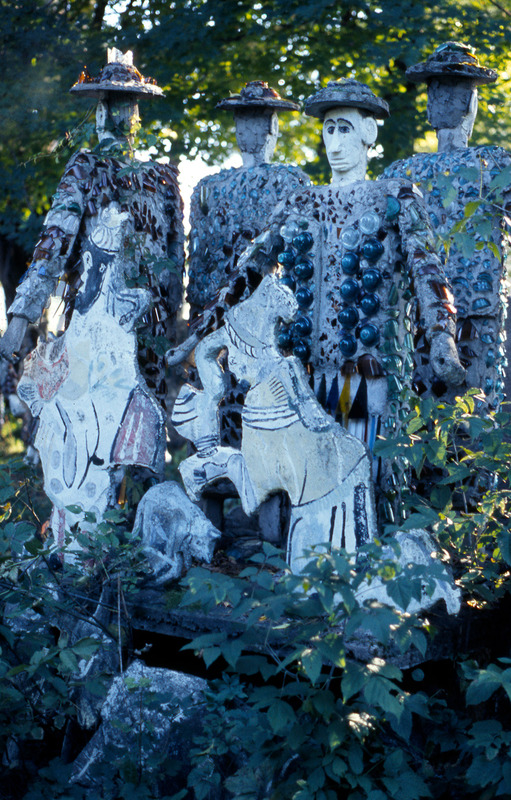 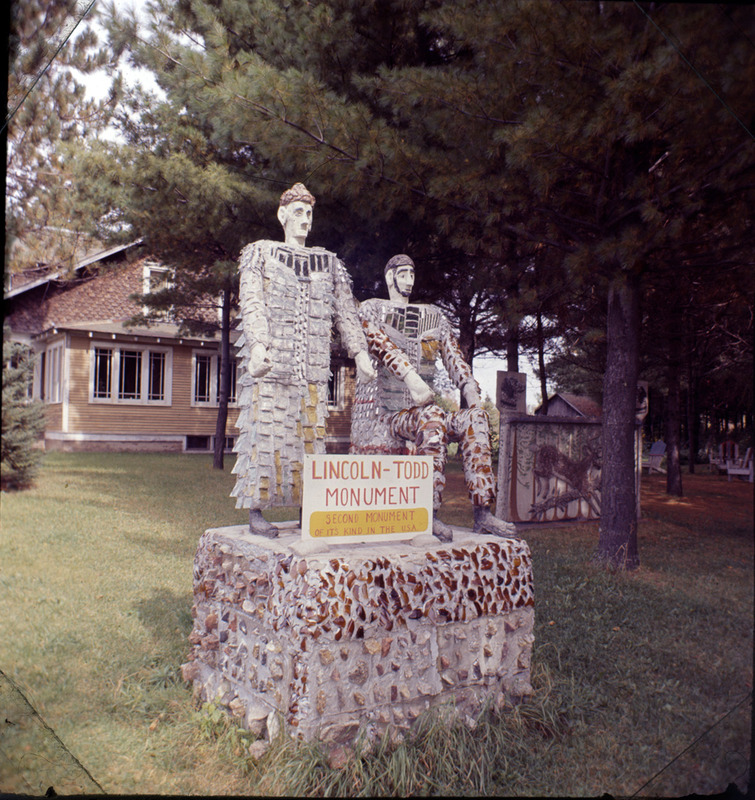 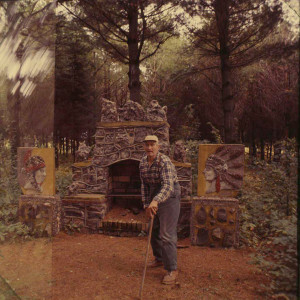 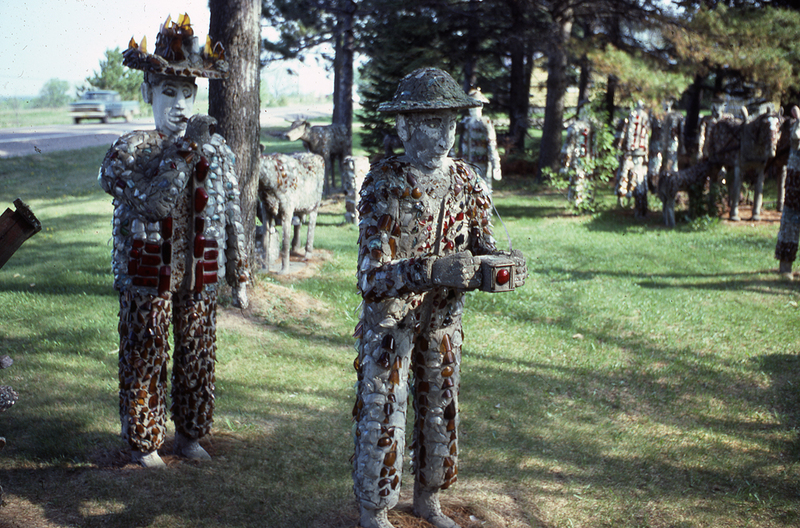 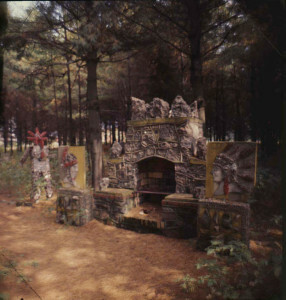 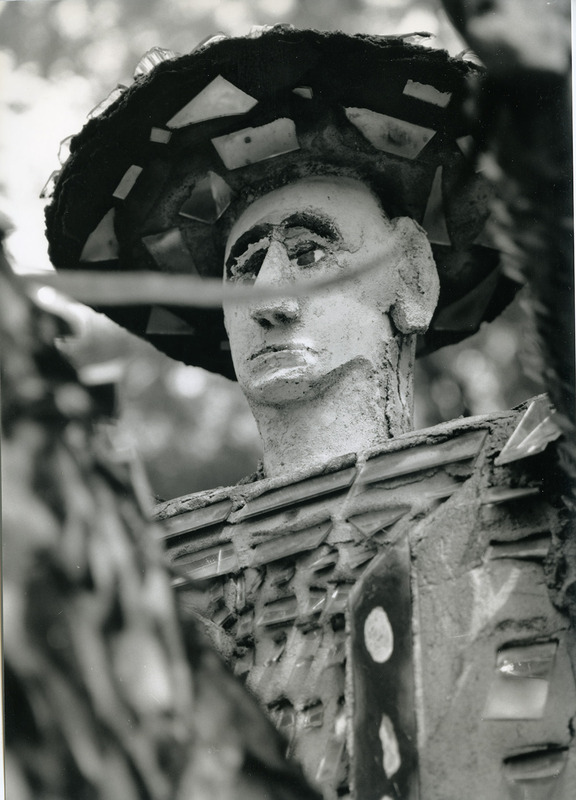 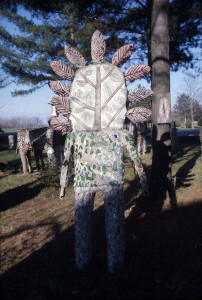 Preservation activities strive to maintain the Wisconsin Concrete Park sculptures, house, and landscape as integrated entities, as close as possible to their original condition and context, during the time period of Fred Smith’s artistic activity, from 1948 – 1964. Don Howlett points to stainless steel mesh and rod, preparing a Bandstand figure for arm replacement. Preservation activities are planned according to the highest preservation and conservation standards achievable. The scope of the site and the conditions it is exposed to necessitate annual maintenance and conservation. 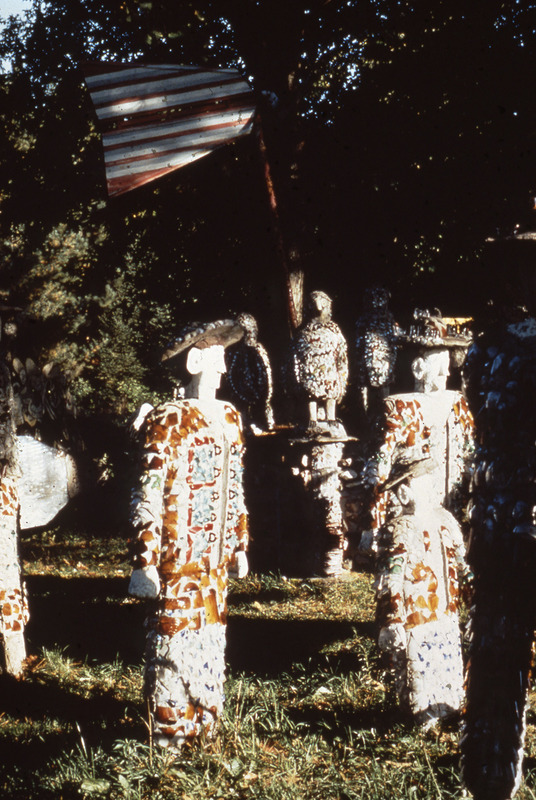 Preservation activities address sculptures and tableaux in order of prioritized need. 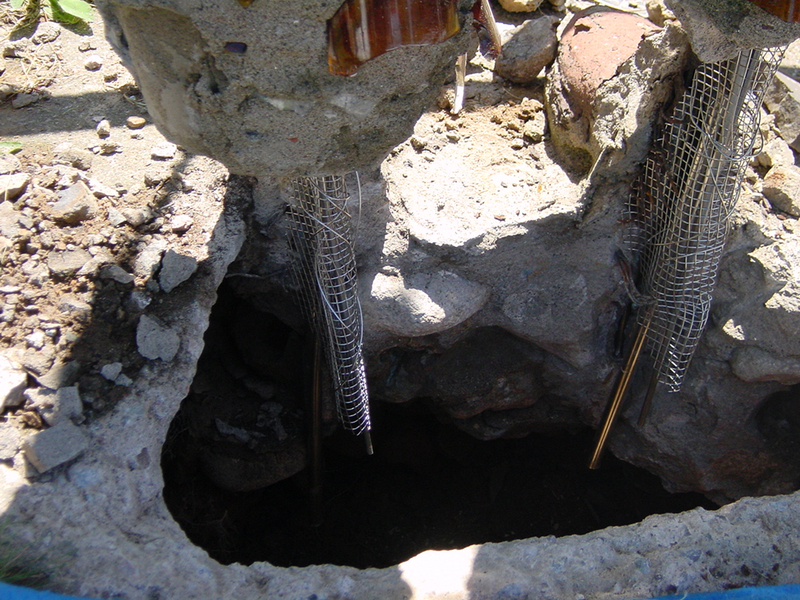 Deer legs receiving stainless steel mesh and wire, preparation for new mortar. 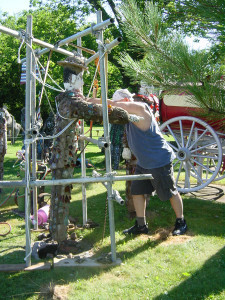 Don Howlett positioning arm for re-attachment. 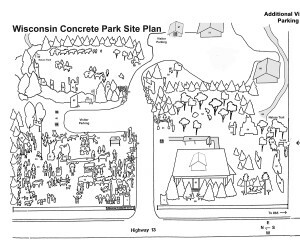 Preservation projects at the Wisconsin Concrete Park have been magnanimously supported by Kohler Foundation, Inc. and the RDK Foundation. 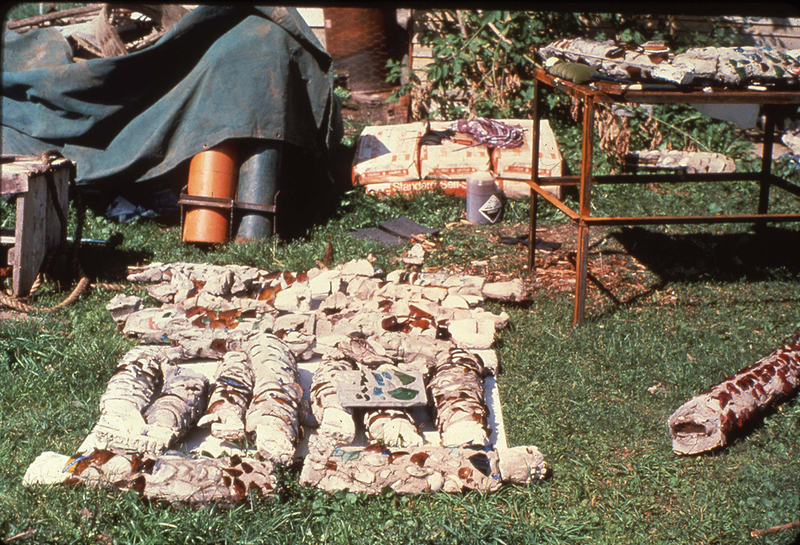 Please have a look at photos of projects from over the years in Photos. 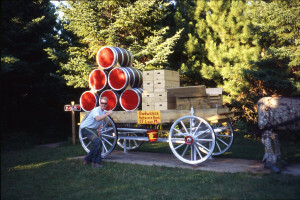 Erik Weisenburger with restored and repainted Budweiser Display wagon. 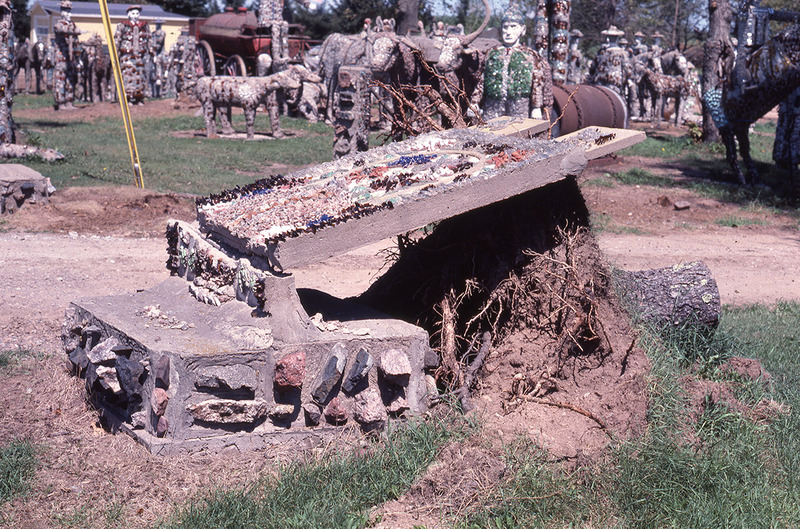 The Wisconsin Concrete Park has changed a lot since Fred built his last sculpture in 1964. 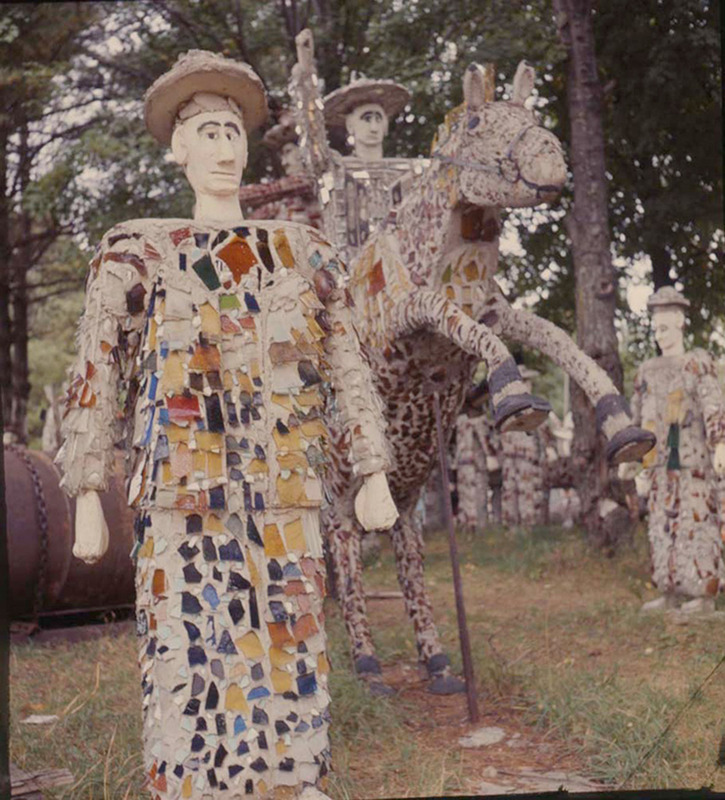 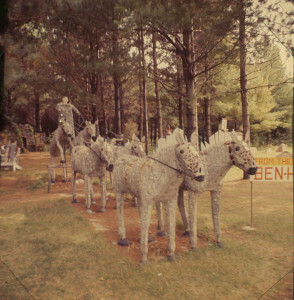 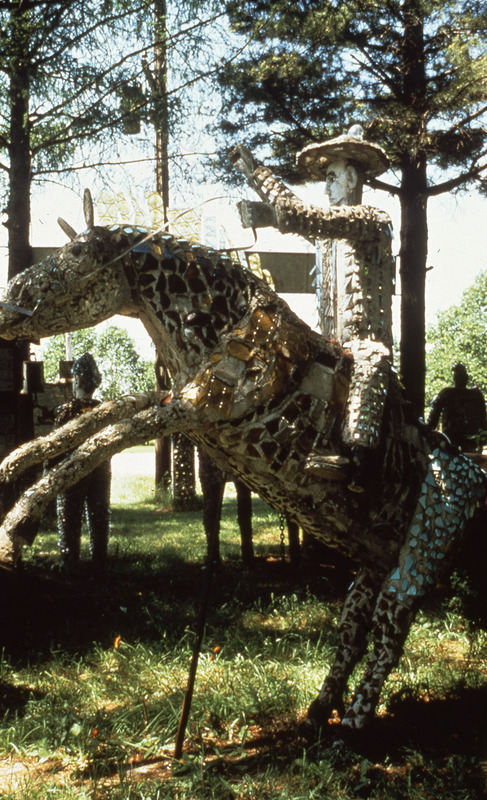 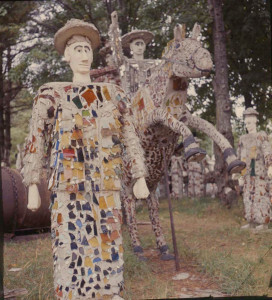 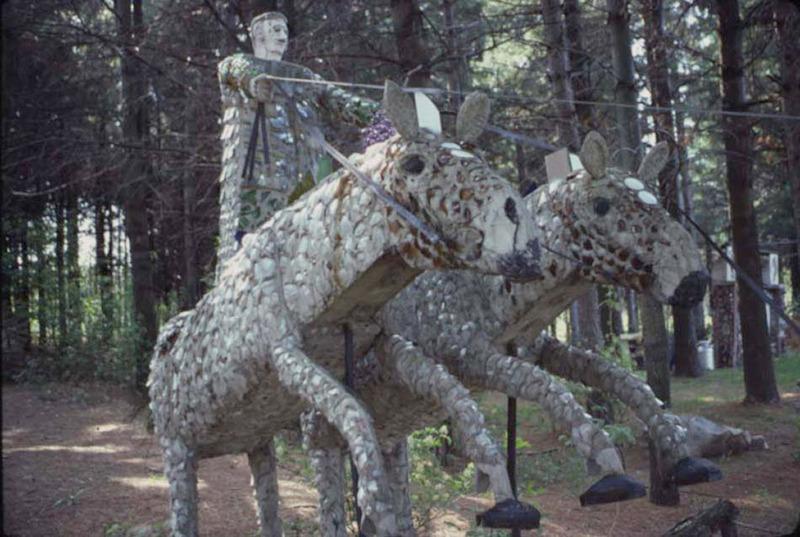 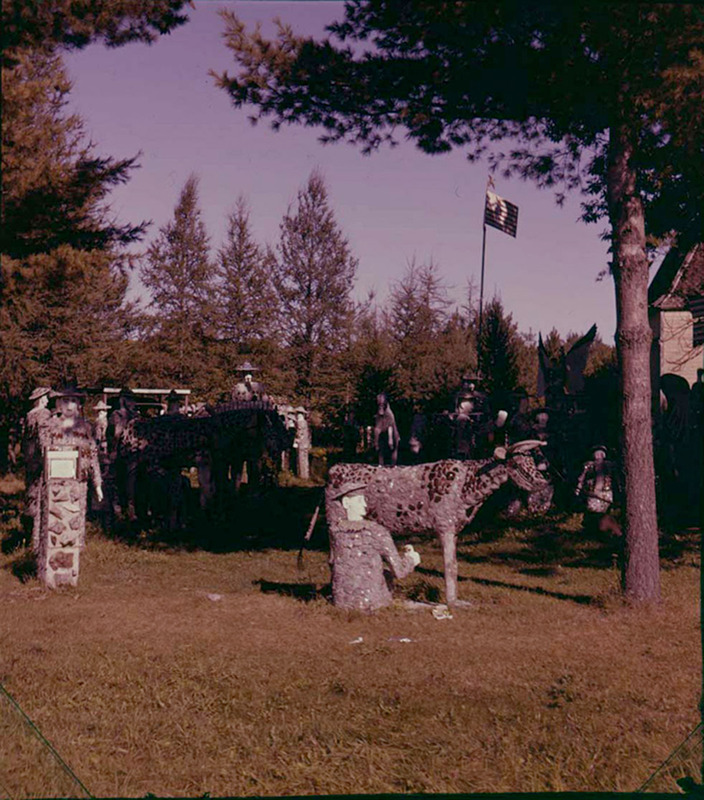 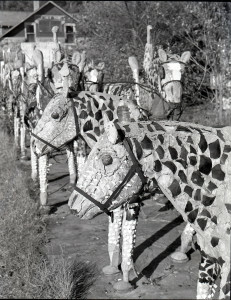 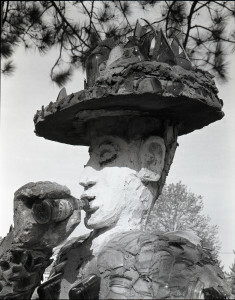 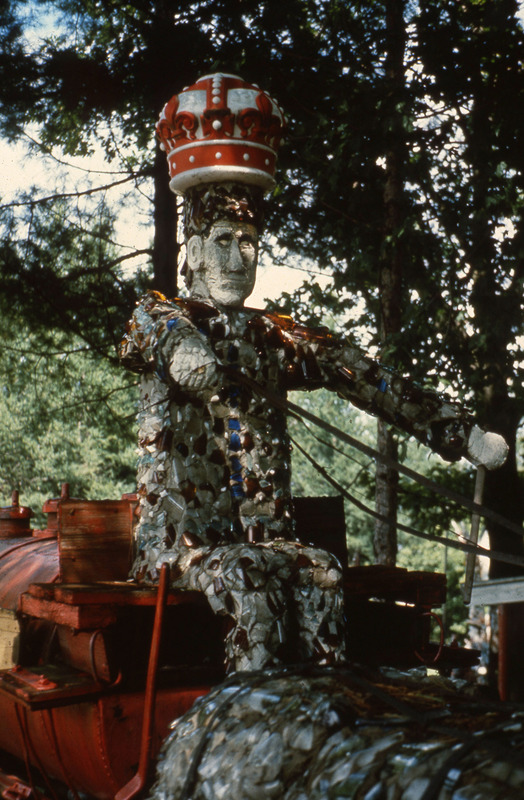 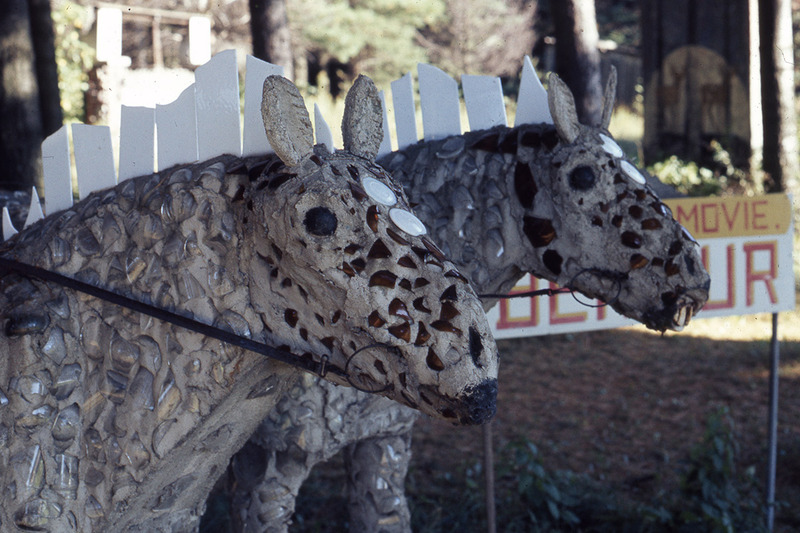 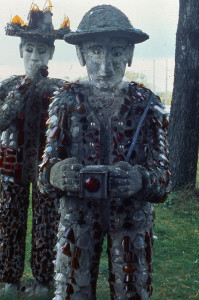 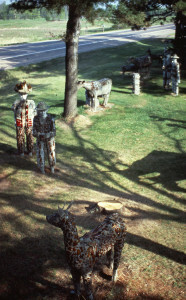 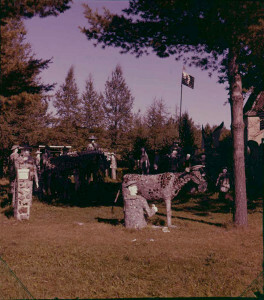 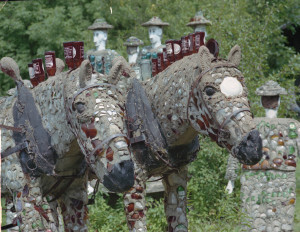 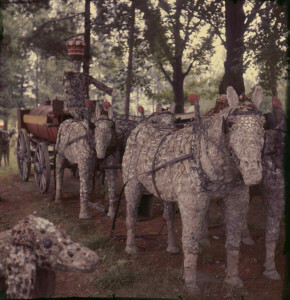 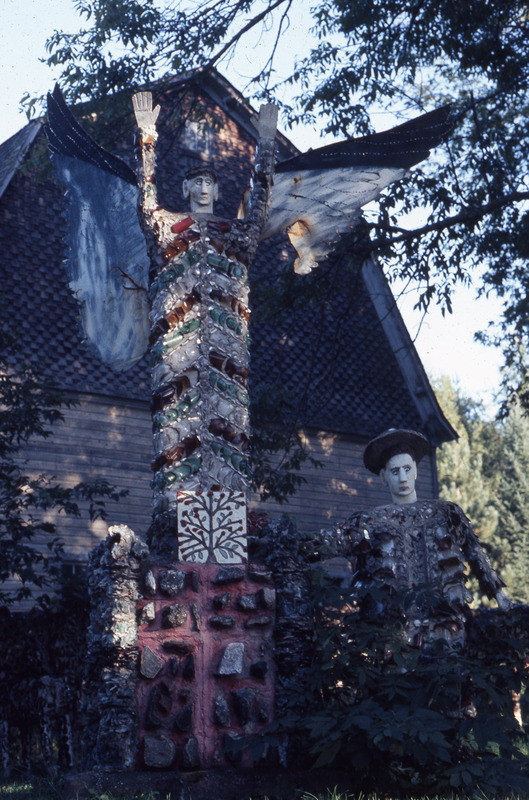 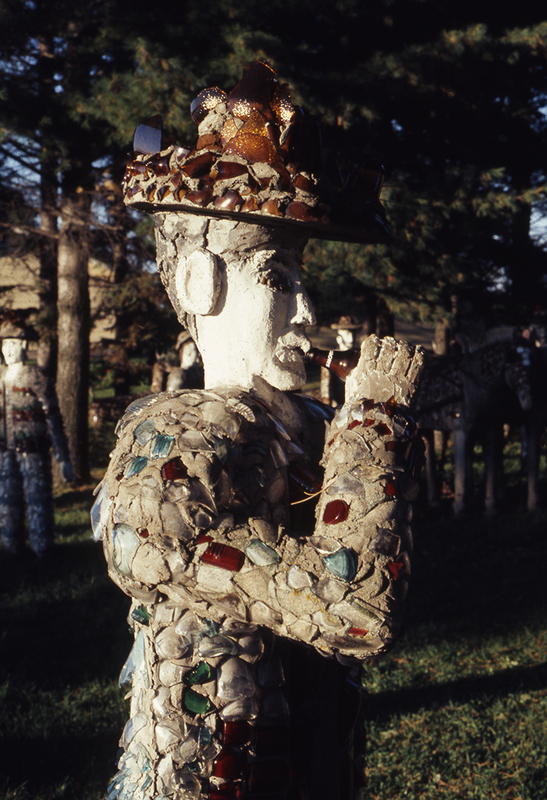 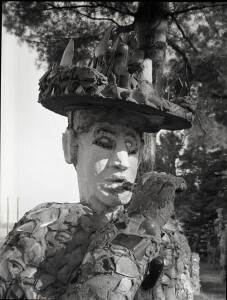 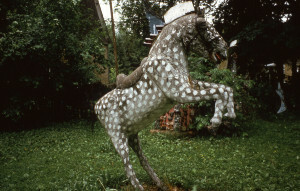 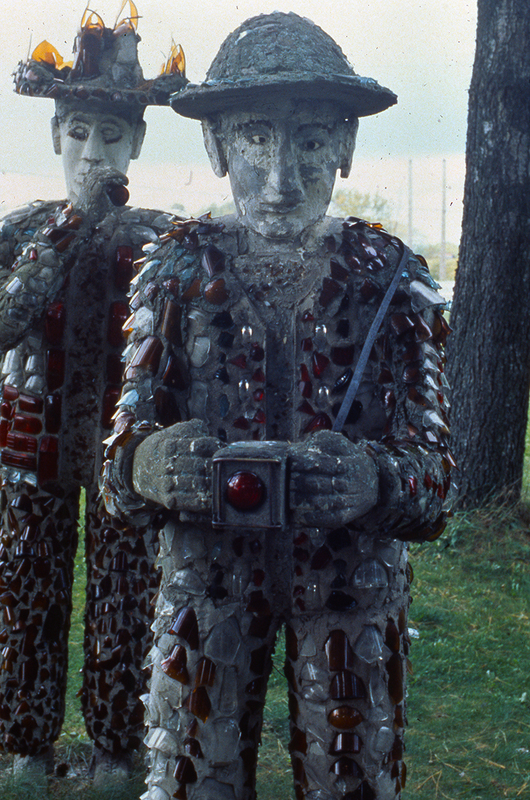 Sculptures were moved from the Rock Garden Tavern to the east meadow. The 1977 and 1987 storms changed the site from a tree-filled to a more open setting. 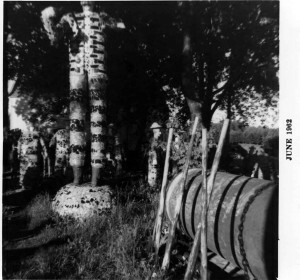 Highway 13 was raised and a ditch and fence separate the road from the Park. 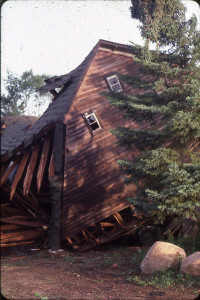 Smith’s barn was wrecked by the 1977 storm and a garage was built in its place. The driveway was widened and parking has been expanded several times. The garage was moved to the rear of the site and is now the Friends of Fred Smith workshop. Additions of the Friends of Fred Smith Studio and public washrooms vastly improve our facilities. 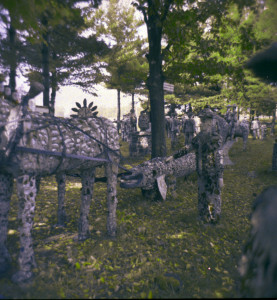 The Park survives change! 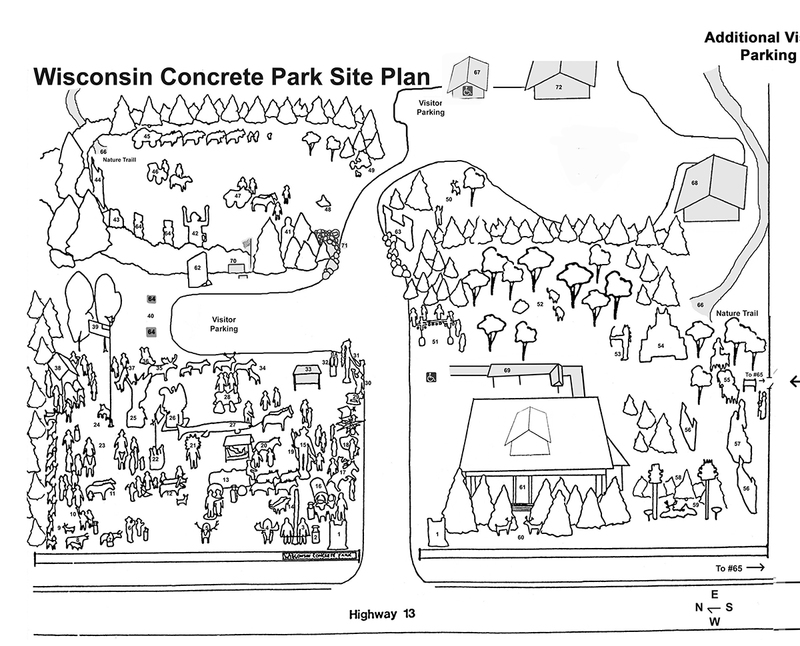 Wisconsin Concrete Park Site Plan. 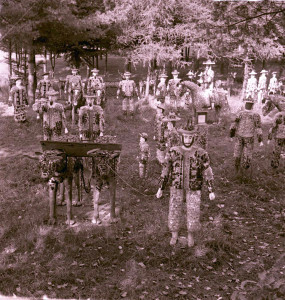 Note: the site plan reflects many changes that occurred since 1977; sculptures have been relocated and buildings have been added. 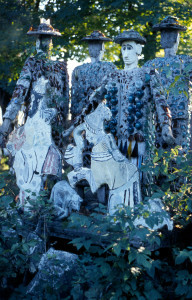 Please note: Bold face titles indicate sculptures moved from their original locations and elements added by Price County or Friends of Fred Smith. 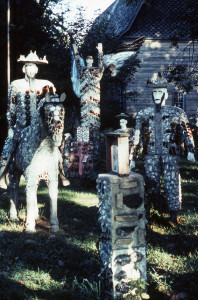 Fred Smith didn’t assign official titles to his work. 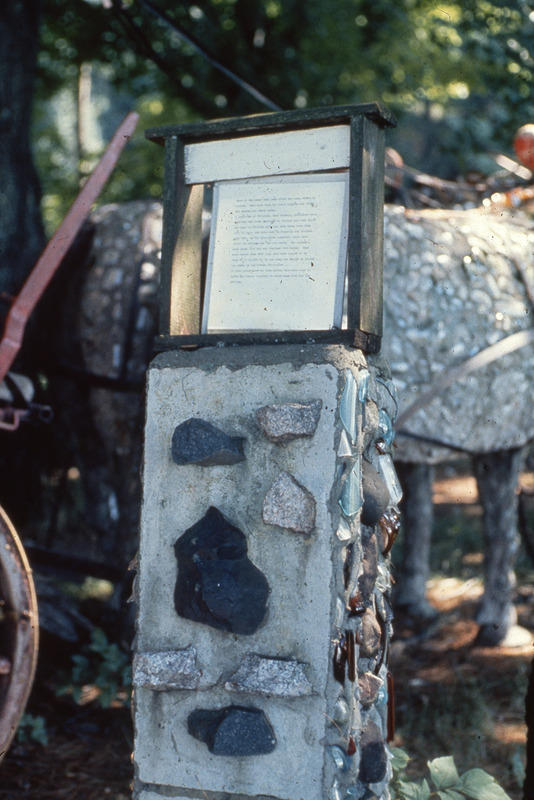 Some descriptions come from Smith’s information plaques, some are from his verbal descriptions, and some were applied by site caretakers.